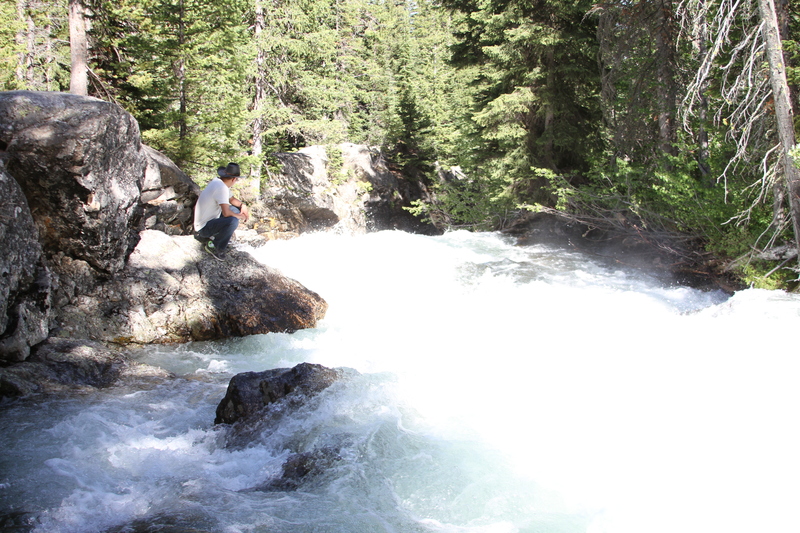 Last weekend we shed life’s conveniences and spent some time in the wild. We went camping. For three nights we slept in a tent. But before you think it was really miserable and uncomfortable, it was not. We have camping cots, so we did not have to sleep on the ground. We also have comfortable sleeping bags, blankets and pillows. We did not go hungry as well, for we did not have to forage for something to eat in the forest or hunt for some wild game. We have canned goods and packed foods in our coolers. We even have propane powered stove and oven to cook our food. Though we build an open fire to keep us warm and for real “camping-feel.” In addition, we have to roast our marshmallows for the s’mores in the camp fire, of course. Furthermore, we did not have to dig a latrine, for there was a modern bathroom facility with several toilet and shower stalls. And with heated running water! 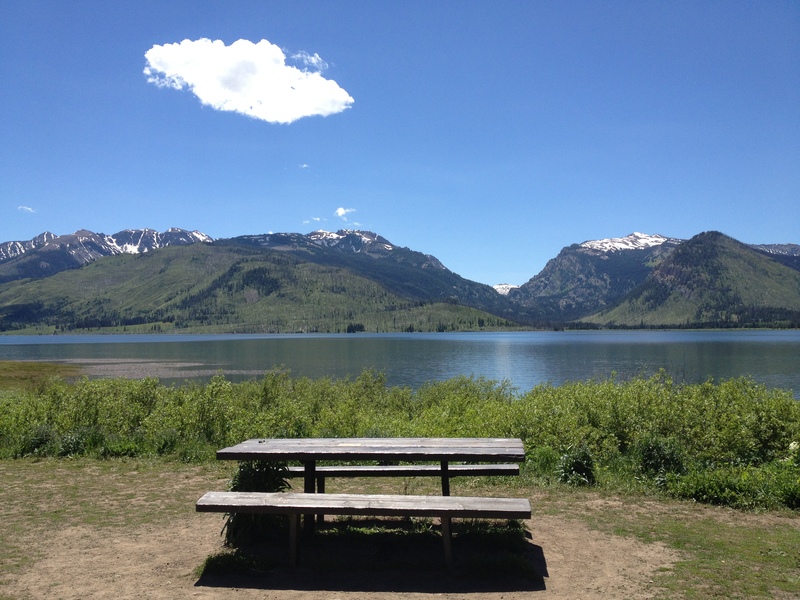 You may argue that what we did was not really camping, but “glamping” – glamorous camping. However, there’s one life’s convenience or some may even consider this a necessity nowadays, that was not available in the campsite. What is it? 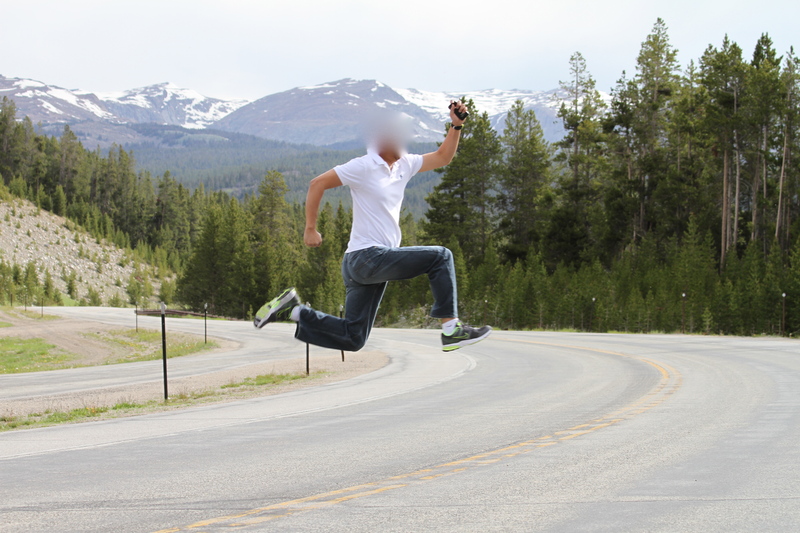 There was no cellular phone signal there. It was a dead zone. For three days, I have no use of my smart phone, except to take photos. No phone calls, no text messages, no e-mails, no Facebook, no news feed, no Google, no ability to check NBA scores, and no access to my blog. Nothing, nada, zilch. In this current age, we are so wired up that we have connection with people around us and even people in the opposite side of the world. Phone call, texting, Facetime or Skype has been part of our everyday life now. I am finding out that nowadays courting has been reduced to video chat and sending text messages. What happened to the formal home visit, bringing flowers and asking the girl’s parents if they can meet? I am not saying that this is bad, as it has made our world smaller. This technology has been a lifeline for families that have loved ones working overseas. Skype, Facetime, or any form of video chat is definitely a boon for them. With the internet available almost anywhere whether thru Wi-Fi or cellular signal, we have access to any information we need. I remember the days we have to go to the library and search for the facts and data we want. Today, we have that instantly at our fingertips that I am not sure our present society will survive without this technology. But I survive without a phone signal and internet for 3 long days. Proving we can live without it. The only connection I had there was with people around me in the “here and now.” You may say that we were isolated from the outside world, but there was plenty of interaction and connection in those days we were on the camp. Where we went was a camporee. My wife and I volunteered to join my son’s club as supervising adults. There were 25 other youth clubs, and more than 300 people in that camp. So there’s a great deal of communicating and socializing. Though not by Facebooking or texting. Yet we did have some “long distance” interaction while we were in the camp. We witnessed the mighty sun as it sets by the lakeside and it was gorgeous. We marveled at the distant bright stars above us at night. 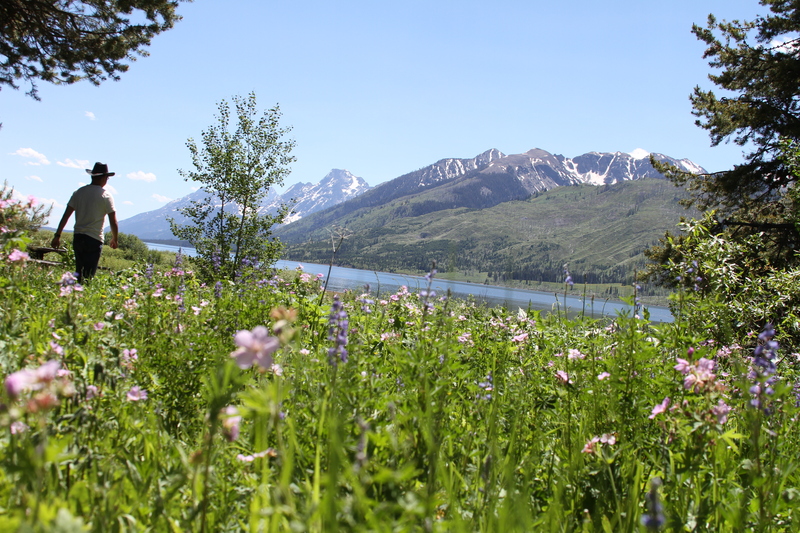 Moreover, we had quiet communing with the Creator who surrounded us with these beautiful nature, who by the way, is really nearer than we think. I believe we should be spending more time unplugged. It’s summer here in our place. Well, not quite officially, as the summer solstice is not until June 21 which marks the official start of summer in the northern hemisphere. Yet the mercury is rising, as our high temperature for the past few days and the coming week will be in the 90’s to even reaching 100 º F.
But this morning, it was a comfortable 74 º F, so I went out for a run. It is also about this time of year that I should start preparing for the half marathon, if I should decide to join again this coming fall. As I was approaching the small pond in my running route, I have to stop and let the family of geese get off the road before I could pass. The mother goose was already hissing at me as I was approaching them. They can be very territorial you know. But that’s fine, I can share the road with them, and I have no plans on swimming in their pond. When I came to the wooded areas, I also saw a deer. But it bounded quickly away before I could take out my phone out of my pocket to take a photo. It might be sneering at me that I am too slow. 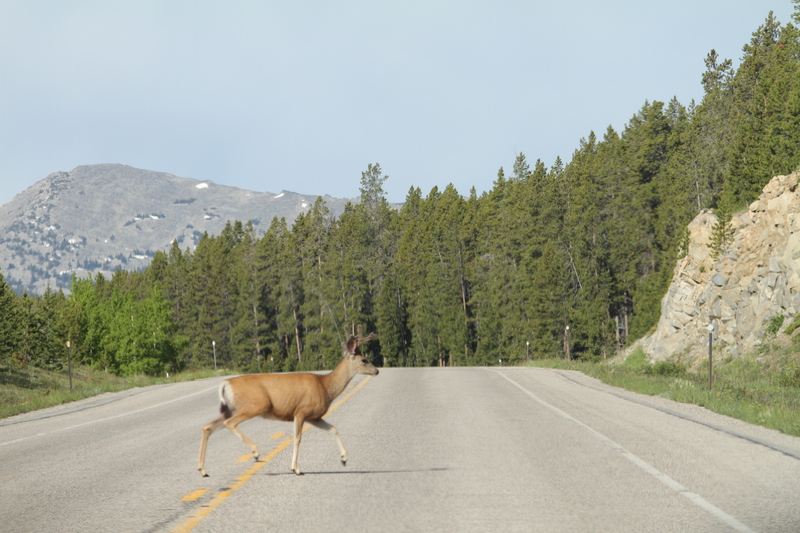 Same thing happened when I came to an area where a couple of wild rabbits were on the side of the road foraging for food. They also scurried away at the sound of my slow feet, before I can get near them. They may also laughing at me for being slow. Maybe all of us can relate in one way or another, and in different endeavors, that we feel we are no match to the “competition” we are going against. Whether it be in sports, or in school, or in our work, and in life in general. 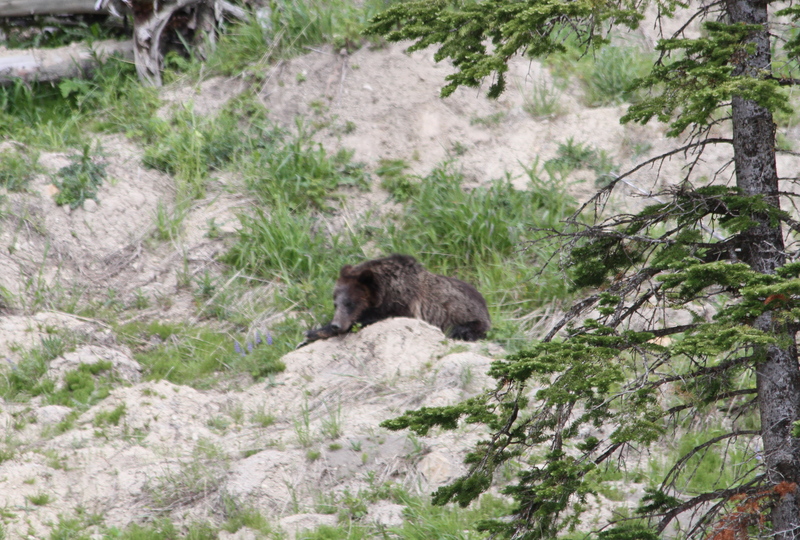 Then as I was fighting my way uphill, I saw this guy. 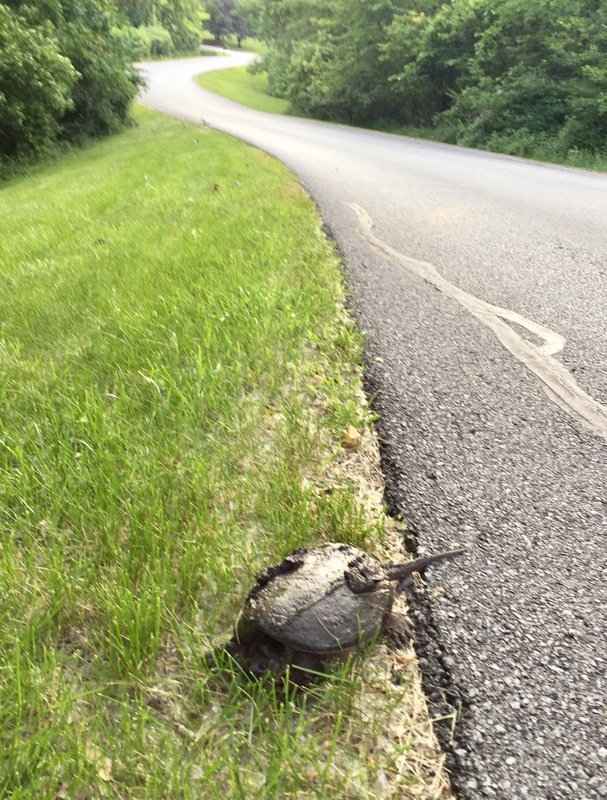 Yes, that is a snapping turtle. And I was “quick” enough to take a photo of him. They are called snapping turtles not because they snap their fingers as they go, rather they have the ability to snap, as in bite an attacker. That’s why I kept my distance. 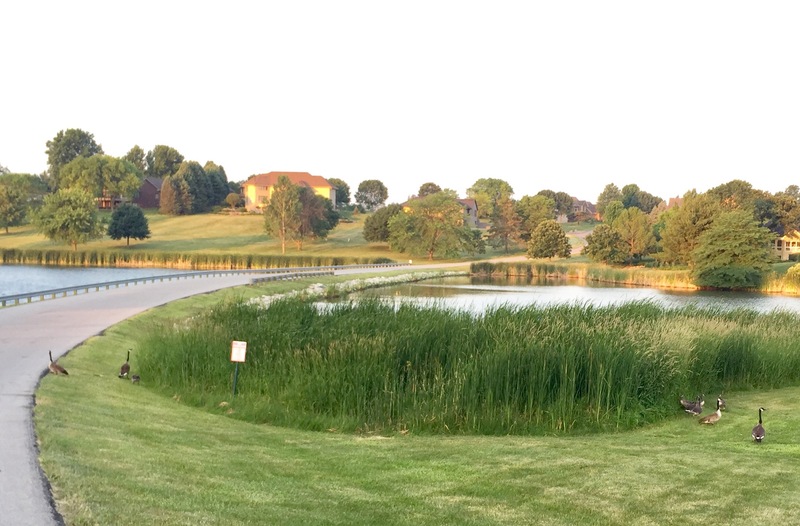 The pond, or any body of water that I know in this area, was hundreds of meters away. I don’t know how long it would take him to get there, if that was where he was heading. But I’m sure his slow pace does not stop him from continuing, for that’s who he is. It gave me a good insight for the day. Life they say could be like a race. But it is not always for the swift, but to those who kept on running. 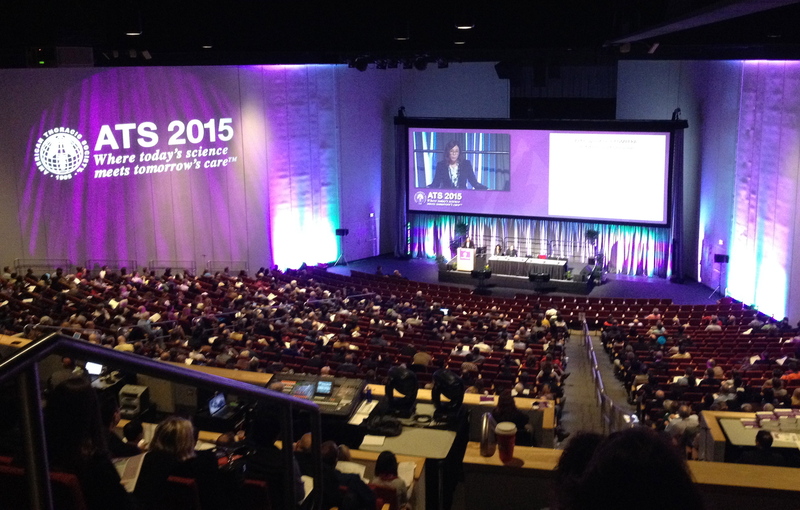 I regularly attend conferences, so I can be updated on the latest practice trends, new researches and studies, breakthrough treatments, and recent technologies. In these meetings, I have the chance to meet and listen to very smart people. But in the same time, it gives me the feeling of how inadequate and ignorant I am compared to them. This conventions also give me the opportunity to travel and see other places. 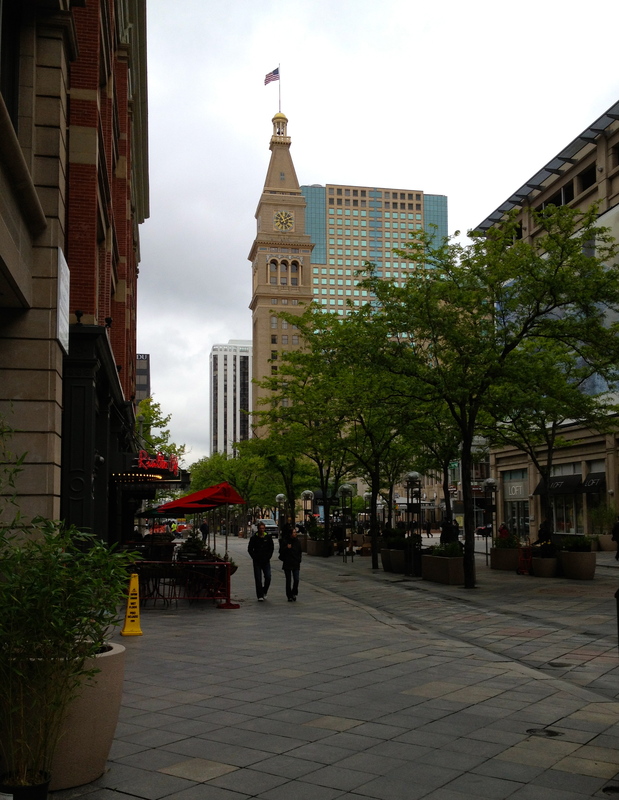 This year brought me to Denver, Colorado. 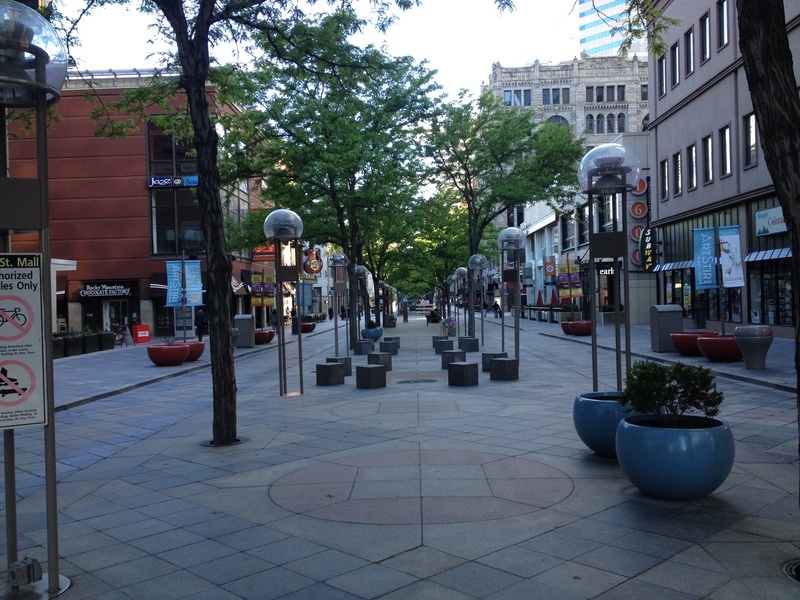 Denver is also known as the Mile-High City, for the obvious reason that it has an elevation of 5,278 feet above the sea level, or about 1 mile. 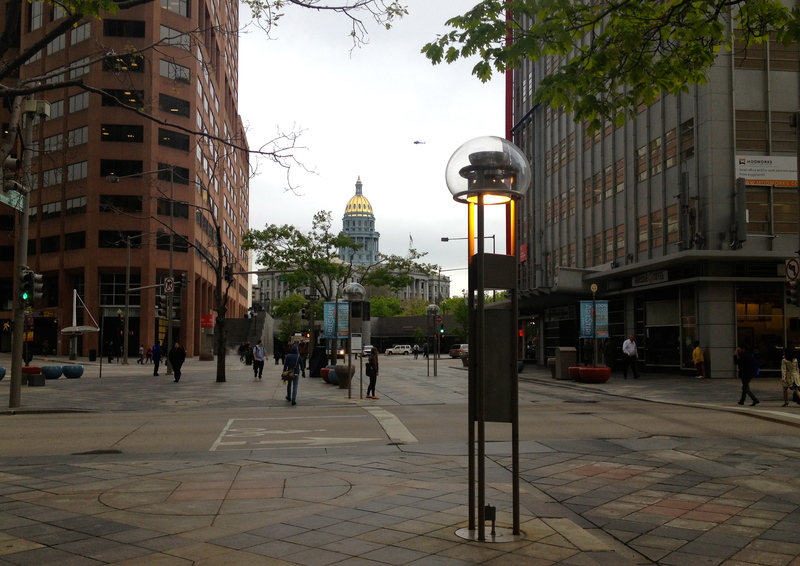 It was the capital and the most populous municipality in the state of Colorado. 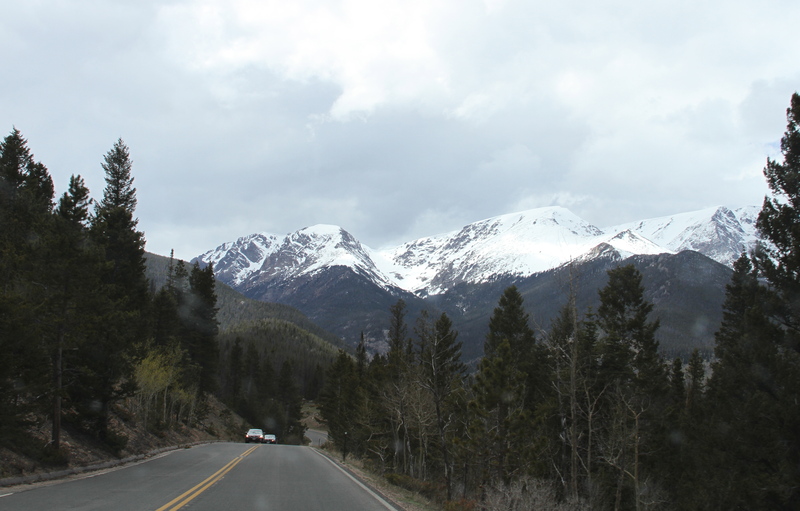 It was founded in 1858 as a mining town during the Pike’s Peak Gold Rush. Since the school is out, I brought my whole family along with me. It was a business and a leisure trip, at the same time. We also have some really good friends that lives near Denver, so we had the chance to visit with them. We stayed in an old hotel, and I mean really old. 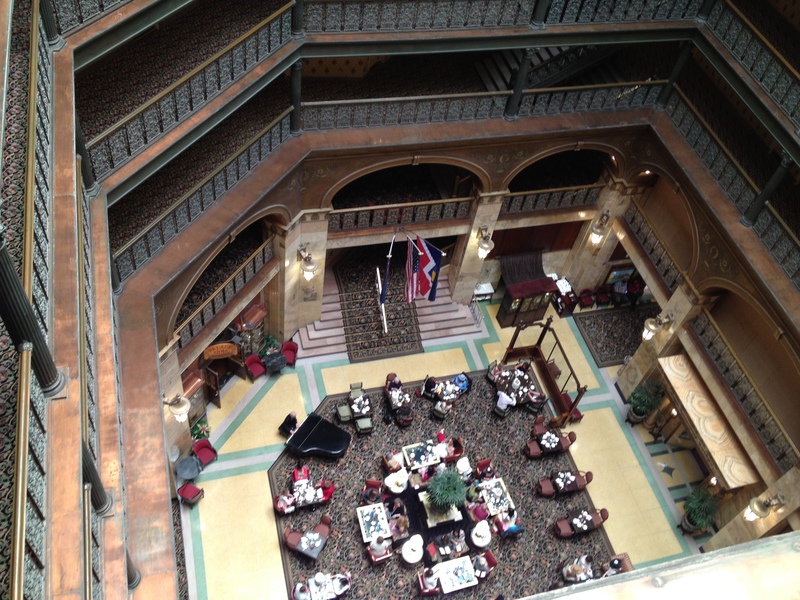 The hotel was built in 1892. 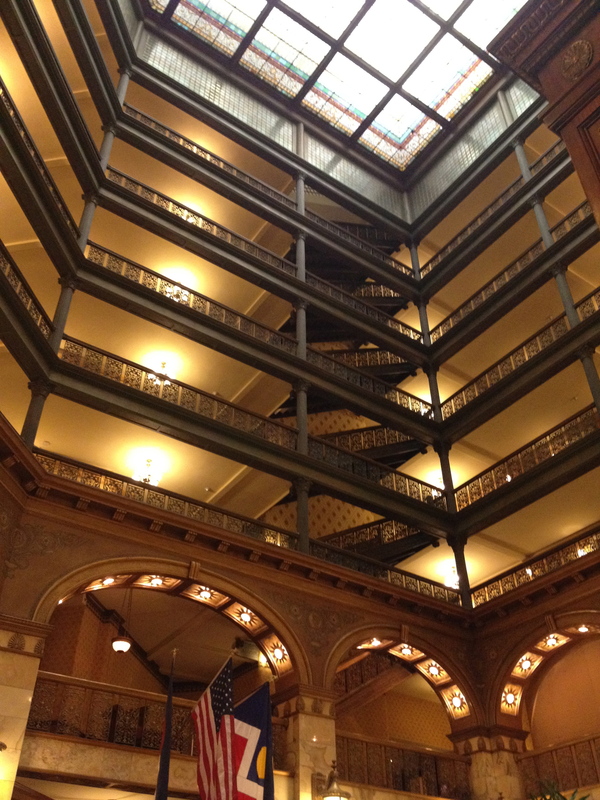 Stepping inside is like going back in time. This hotel also pride itself that every U.S. president has visited it since Teddy Roosevelt (1905), with the exception of Calvin Coolidge. Now they can add that Pinoytransplant was a guest of them too! 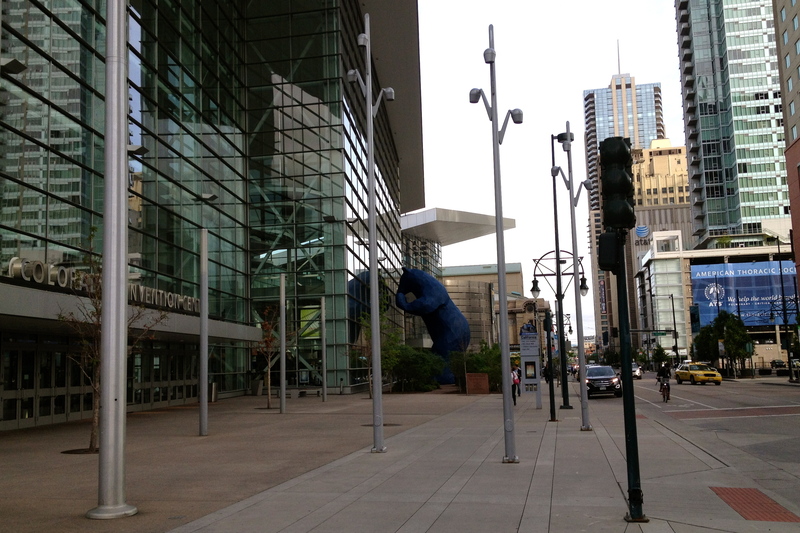 Back to the conference, the meeting was a 6-day affair and was held in Colorado Convention Center. 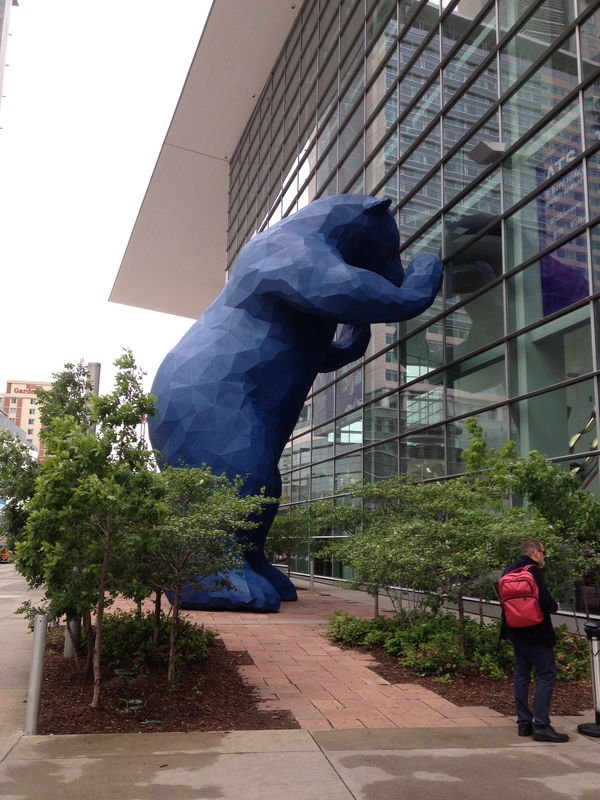 This center is unofficially known as the Big Blue Bear Convention Center. Why? 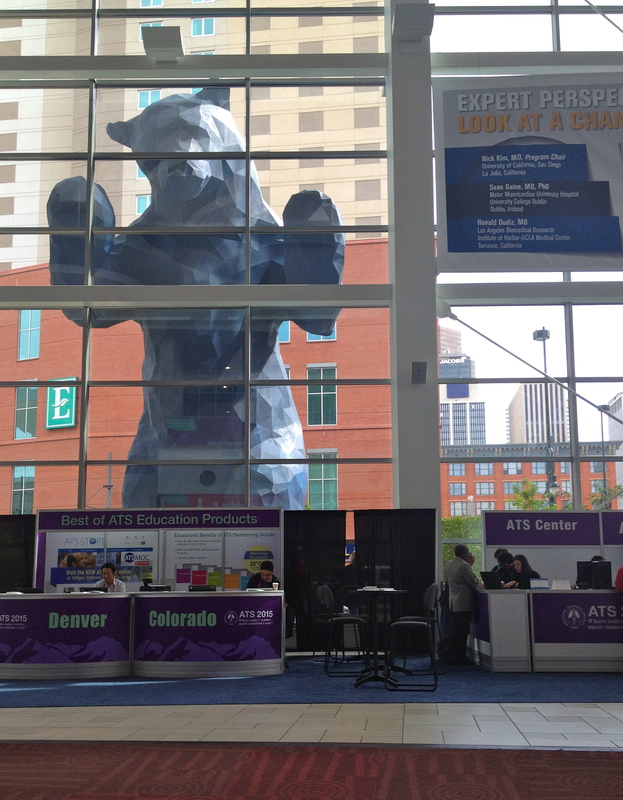 The big blue bear peeks at the lobby of the convention center. Now I see what they mean! Besides very smart people, I also met this fellow. This is what they do to you if you sleep in the meeting. Just kidding! 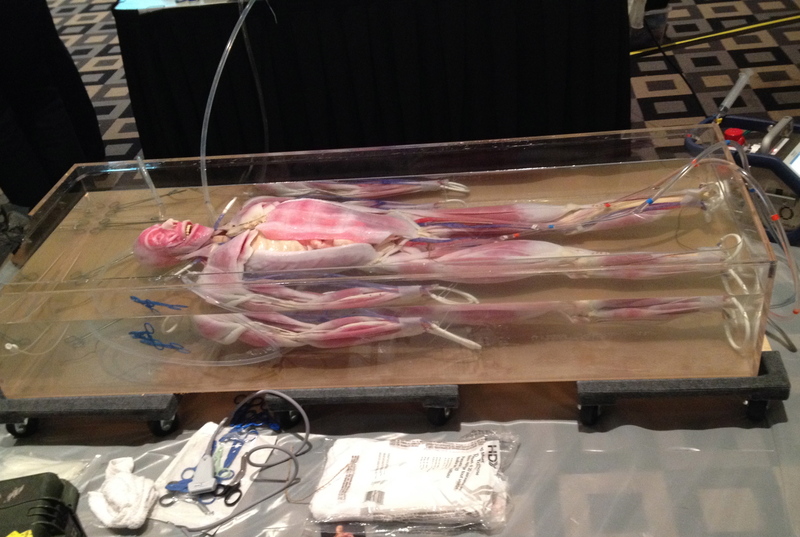 It is not a real cadaver but a synthetic one. It is called “syndaver.” I met him in the post-graduate course I attended, where we placed catheters on him to learn ECMO*. 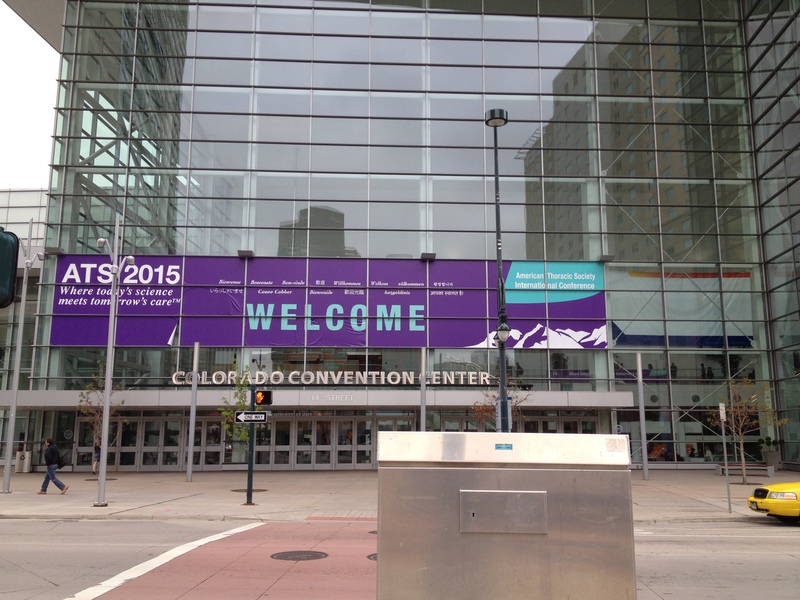 I walked from the hotel to the convention center, as it was just a few blocks away. 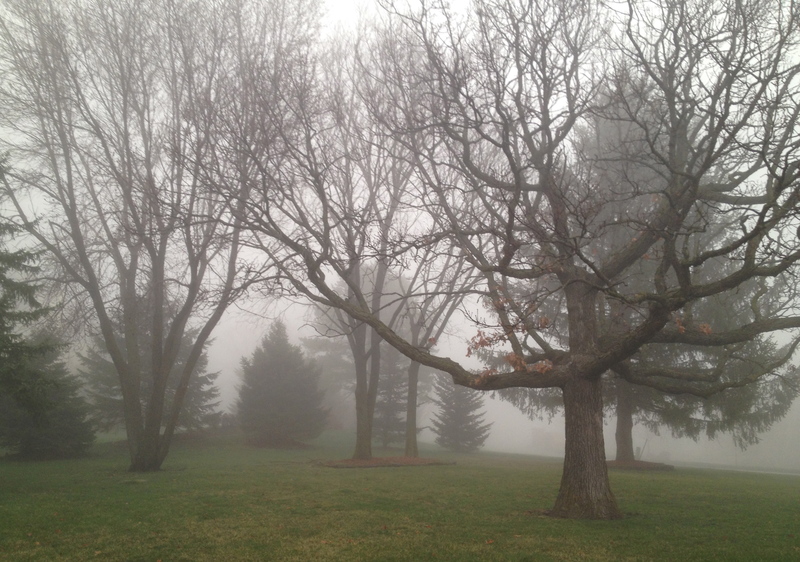 Here are some photos I took on my daily walk. 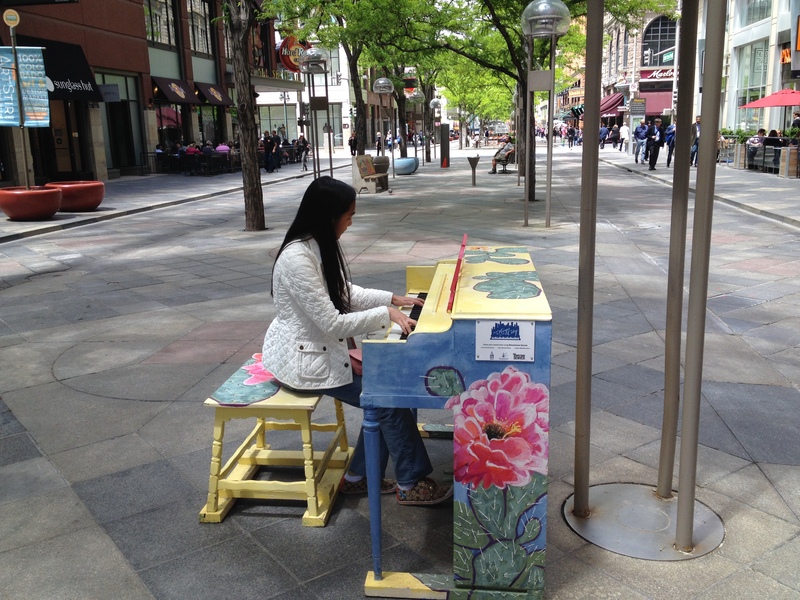 There are even pianos in the middle of the street that anybody can play. My daughter found it irresistible not to tinker with. 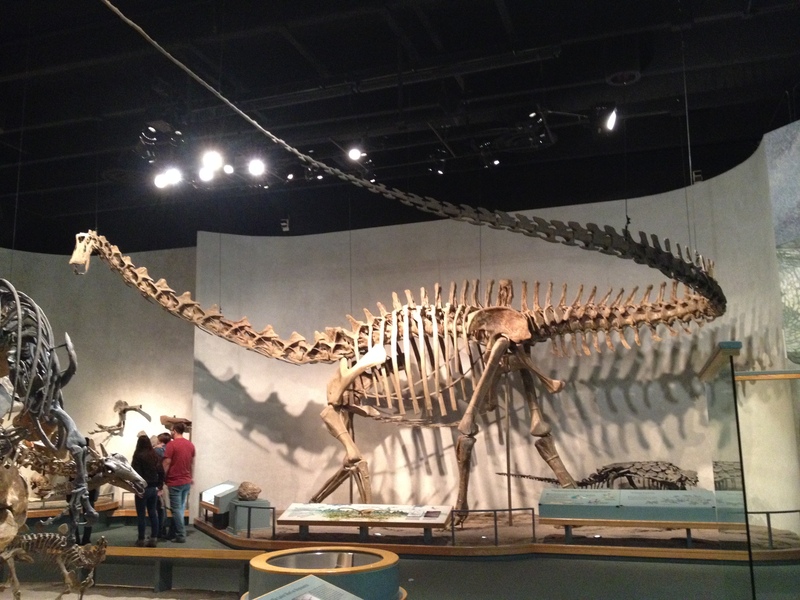 Our friends brought us to the Denver Museum of Nature and Science. This is where I met big creatures. 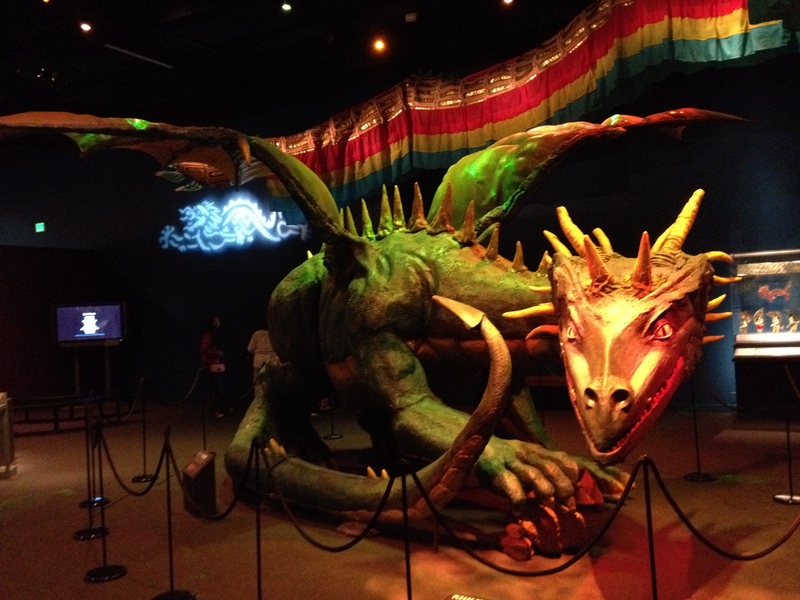 Their current special exhibition is about mythic creatures. 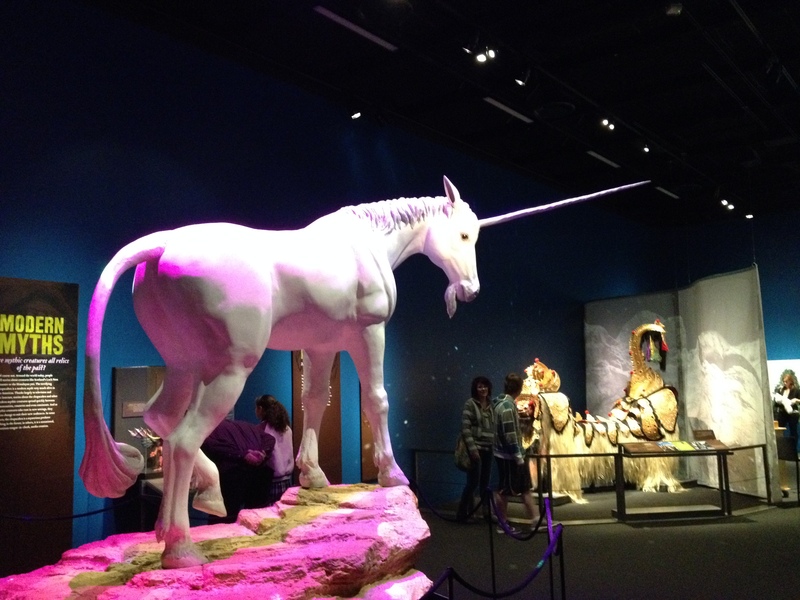 So I encountered a dragon…..
And a unicorn. For real! 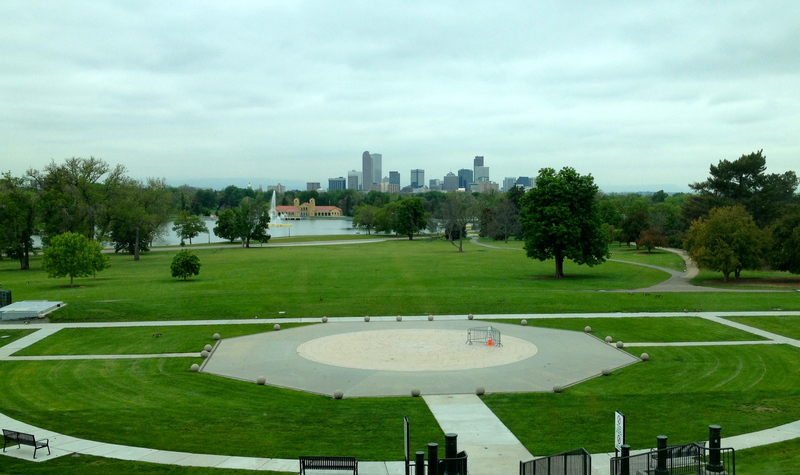 The only downside on our visit to Denver was that during our stay there the weather was not so cooperative. It was raining 5 out of the 7 days we were there. It was even snowing in the mountains. But on the day it was not raining, we escaped into the mountains. 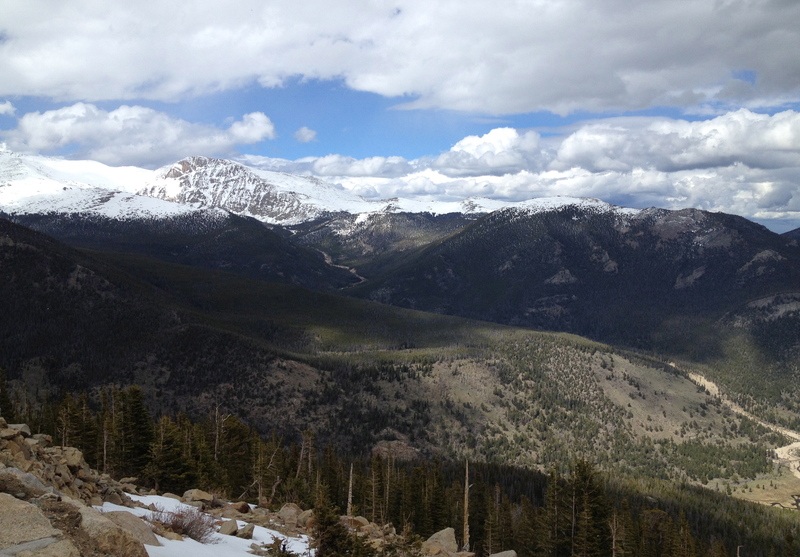 We drove to the Rocky Mountain National Park, which was about an hour and a half drive from Denver. 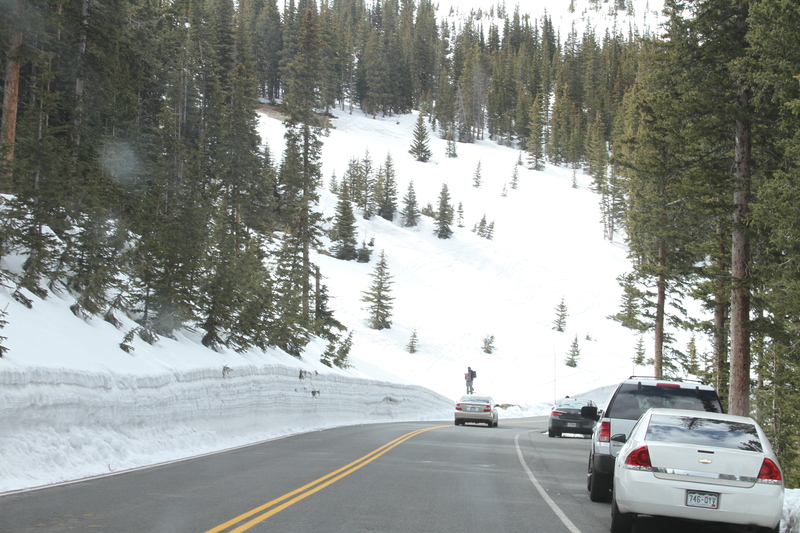 Since it still has deep snow on the top of the mountain, we were not able to reach the peak, due to road closure. But the trip was worth it. 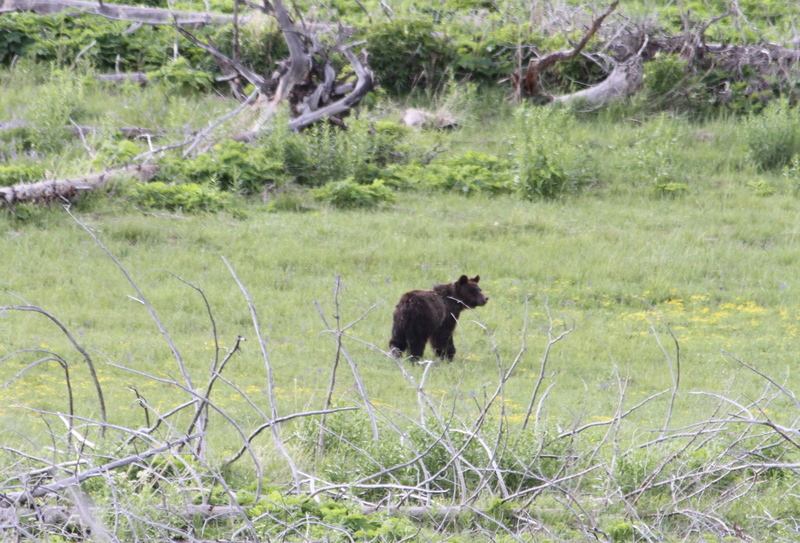 We even spotted a young grizzly bear. For sure, it was a mile-high experience for us. I hope you enjoy the photos of our trip. And speaking of photos, though I am not fond of taking selfie, I cannot resist this. Here’s my very hot selfie! 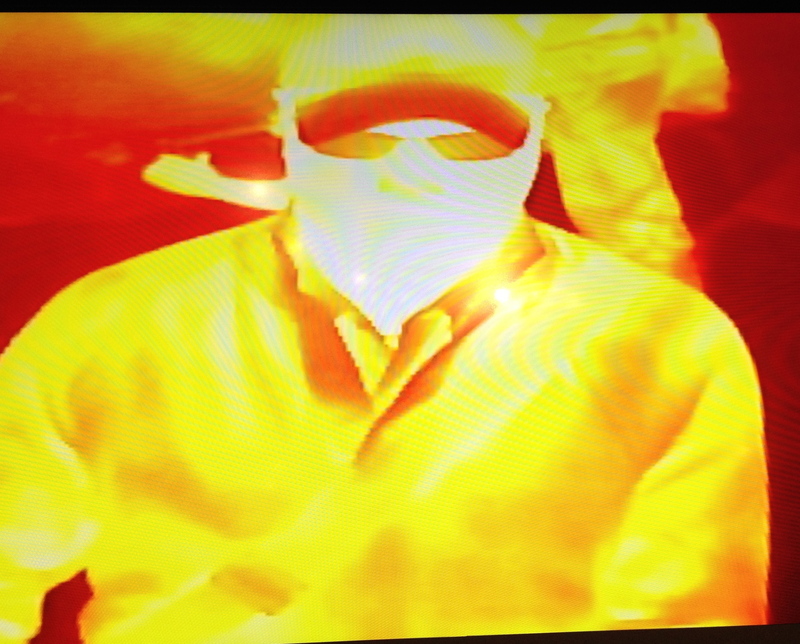 Infrared photo (thermal imaging). Taken at Denver museum. * ECMO (Extra Corporeal Membrane Oxygenation): a technique to deliver both cardiac and respiratory support to patients whose heart and lungs are unable to provide an adequate amount of gas exchange to sustain life. Yet I still can dream, and my dream I would be. Many runners regard their endeavor as a religion. They are so devoted that they may be members of the Nike’s Witness, or the Church of Later-day (and Early-day) Runners, or the Cross-Country Faithful, or the 7-day Joggers. Maybe I am a member of this creed. Then there are other people who treat other things as their religion. Like eating. They perform this as if it is their sole God-given duty. Well, I will not divulge on this subject any further, at least for now. But why shouldn’t we treat running as spiritual exercise? I mean, literally. My training for the half-marathon for this fall is in full swing. I have been doing the short runs (3 miles) at least twice or thrice during the week, and one long run (5 miles and increasing by a mile every week) on the weekend. I am currently on 8-mile long run. That is a lot of time dedicated (or wasted?) on running, you might say. What else can you do with that time? For me, I use that time to clear my head. Or do some serious thinking too. 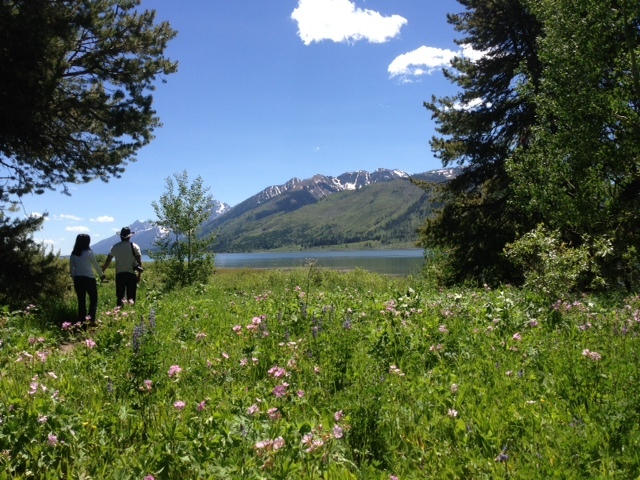 With the beautiful scenery around me, my creative moments (due to relative lack of oxygen?) come during those runs. I have even composed in my head, snippets or even whole article blogs during those period, and I just have to download it into the computer when I sit down. 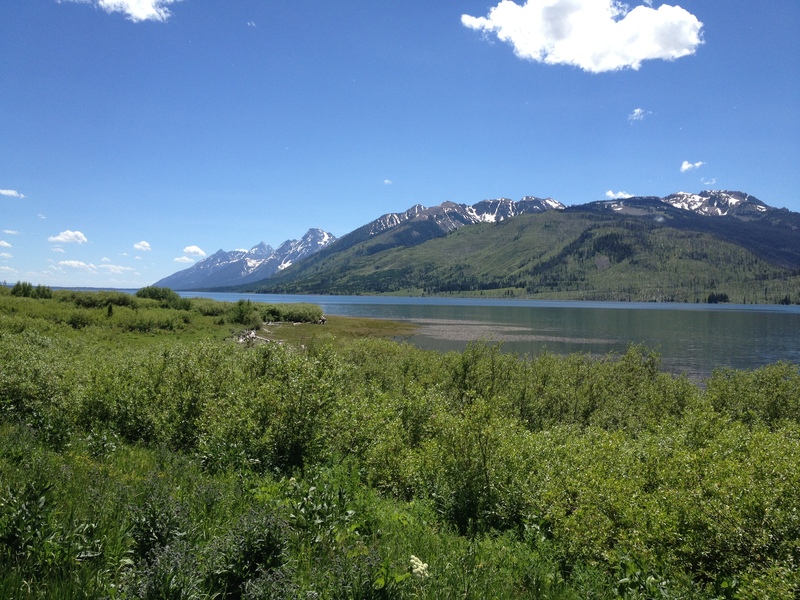 But more recently, I have used those times running alone, as my meditation hour – communing with nature and its Creator. We certainly need those quiet moments. Not much talking, but listening. Not too long ago, during a heat wave in our area, it was so hot that we had a string of 100-degree F days. It was so dry too that we had no rain for weeks, and we were in a drought-like condition, much to the demise of corn and soybean fields here. 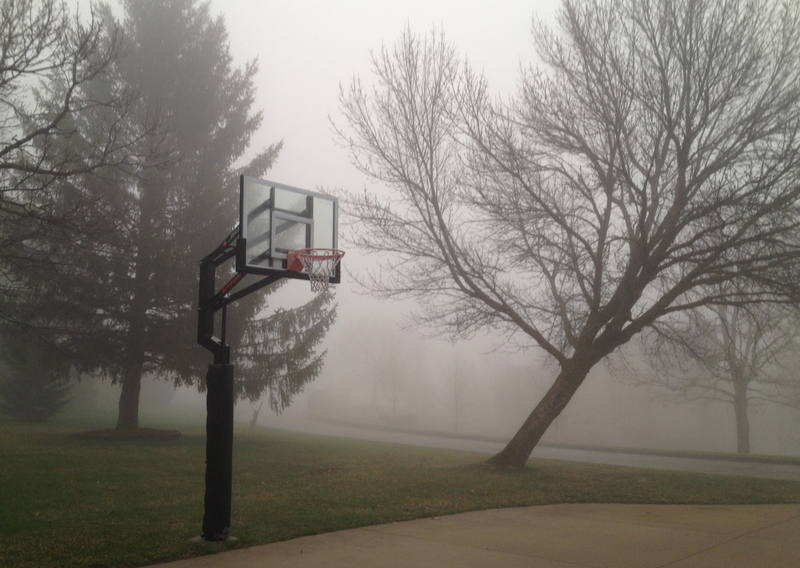 Then one morning, as I went out for my run, the surrounding was all wet from the rain the night before. The parched land was soaked with water. It was breezy, cool and refreshing. I was grateful for the rain, as the farmers in our area were as well. As I was running, I encountered a deer who perhaps was also thankful for the rain. She stood motionless as I passed by, just staring at me. A thought was impressed on me. 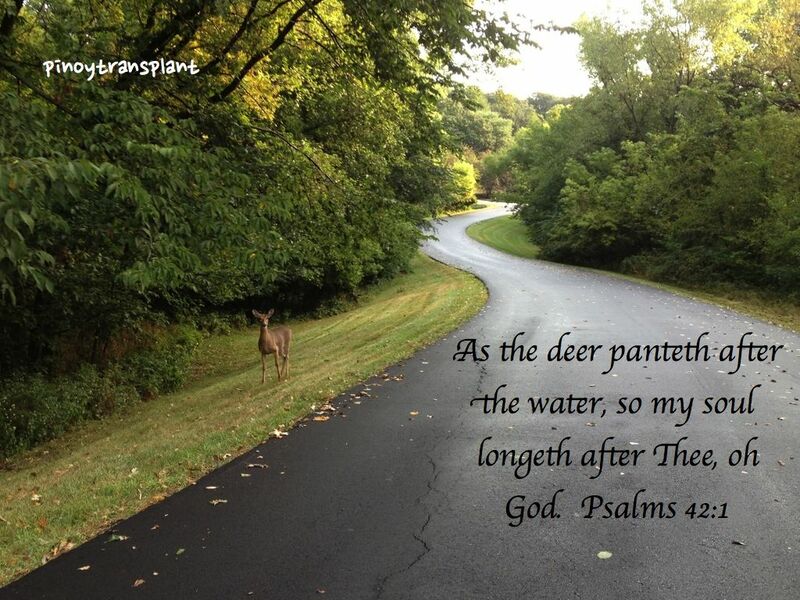 “As a deer panteth for the water, so my soul longeth after Thee.” What a good reminder. To this I add: as a runner panteth for air, so my soul longeth after Thee. May we all have a blessed week. 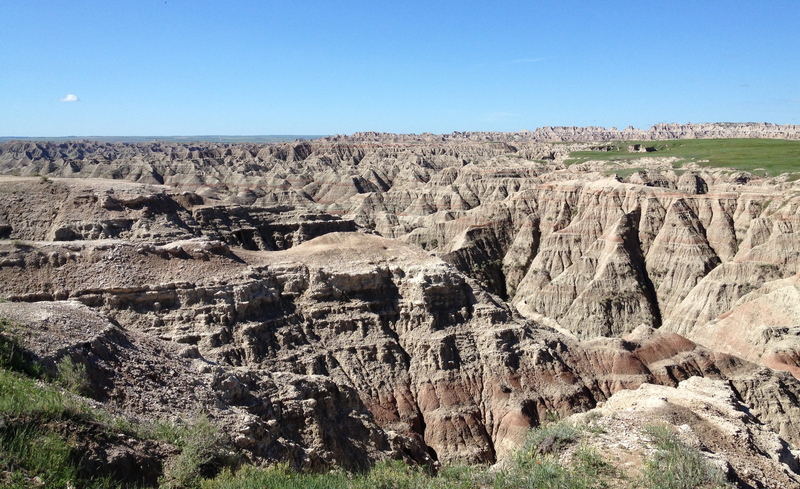 During our recent trip through South Dakota, we passed over Badlands and Black Hills. 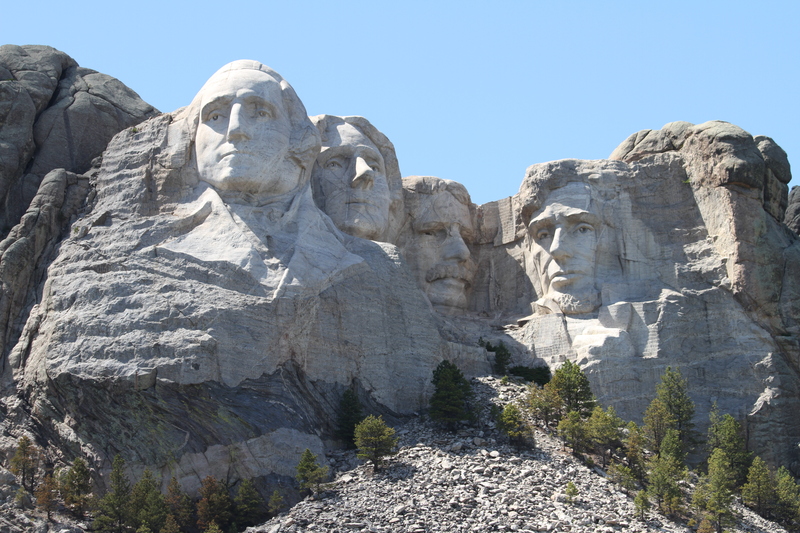 Mount Rushmore, which is part of the Black Hills, is perhaps the most popular National Park in this region. 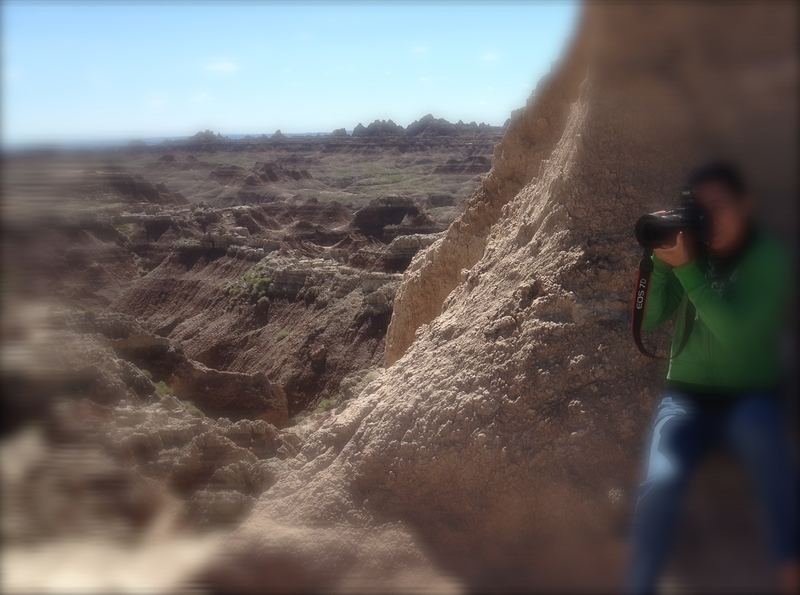 Though the Badlands National Park, has its different appeal and beauty as well. 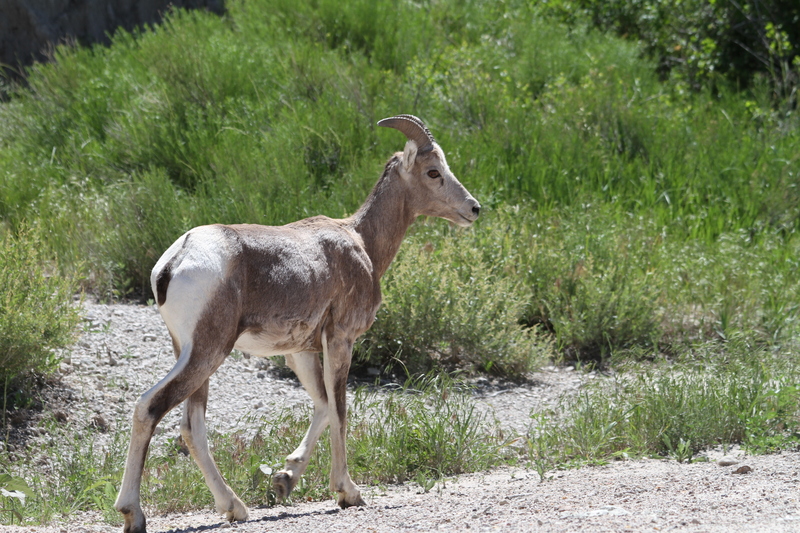 Native to this mountainous terrain is the mountain goat. This creature is agile and sure-footed, and able to climb on steep rocks with grace of a ballerina and steadiness of an experienced rock climber. We were fortunate to see one. I mean the mountain goat in above’s photo, not the one below. 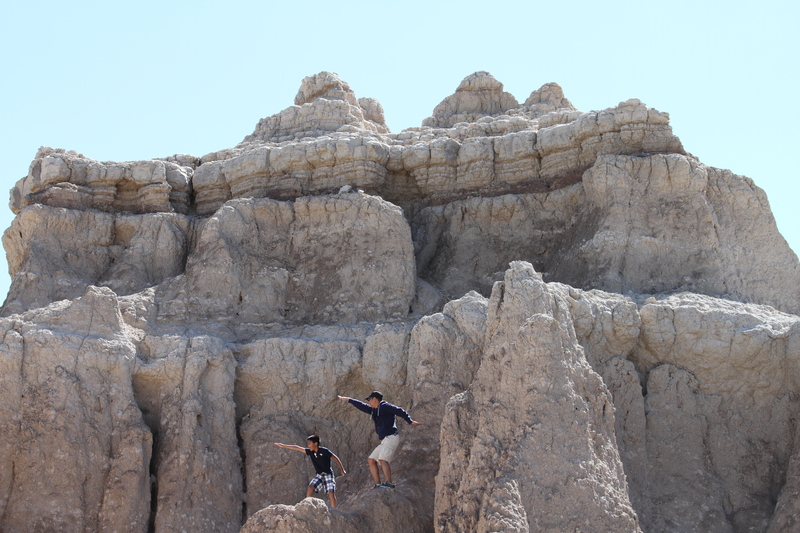 Not to be outdone, and getting inspiration from the mountain goat, my son and I, strutted this “rock-surfing” pose for posterity. 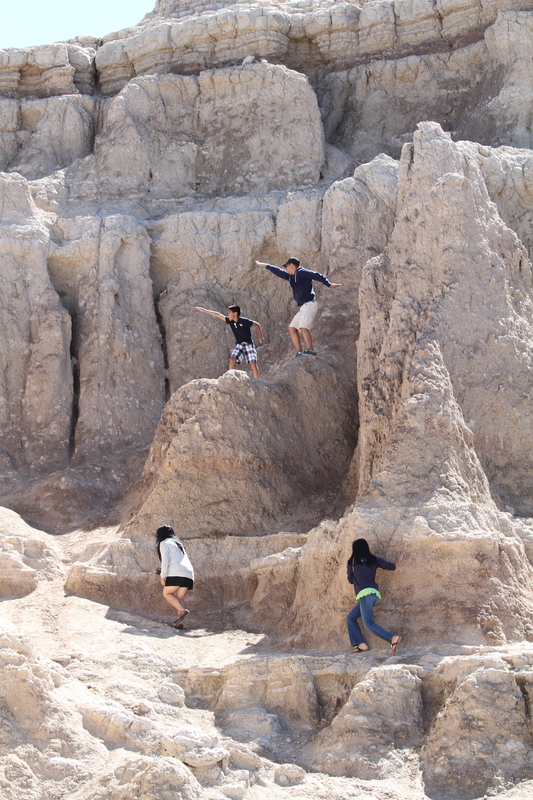 Sorry, the camera did not capture a photo when we dove off the cliff. Just kidding. Our photographer did not allow us. 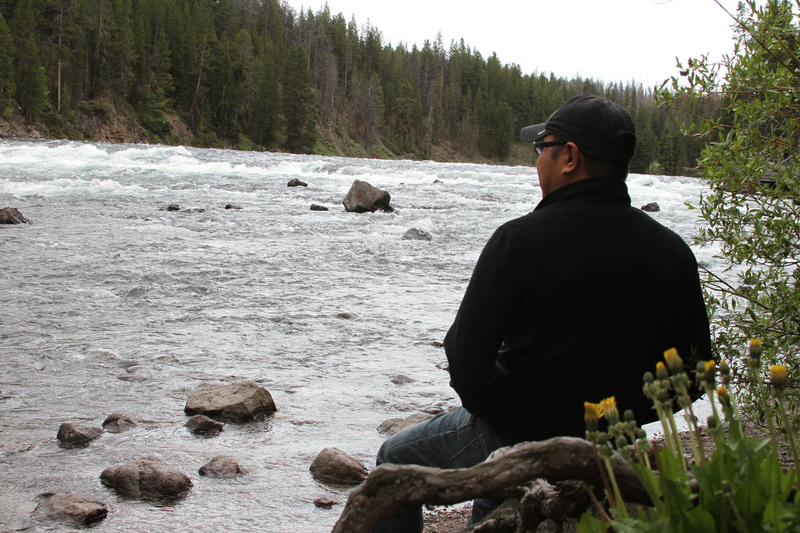 Few weeks ago, we visited Yellowstone. 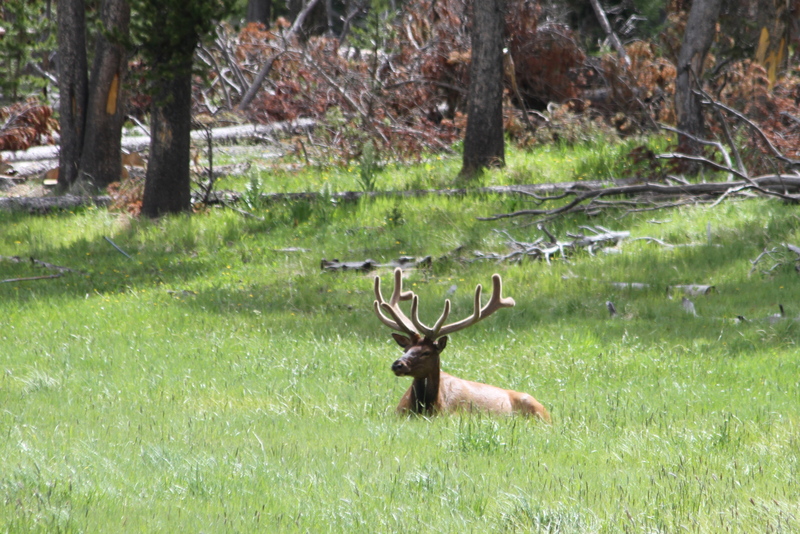 We were captivated, and went wild over it’s beauty and grandeur. 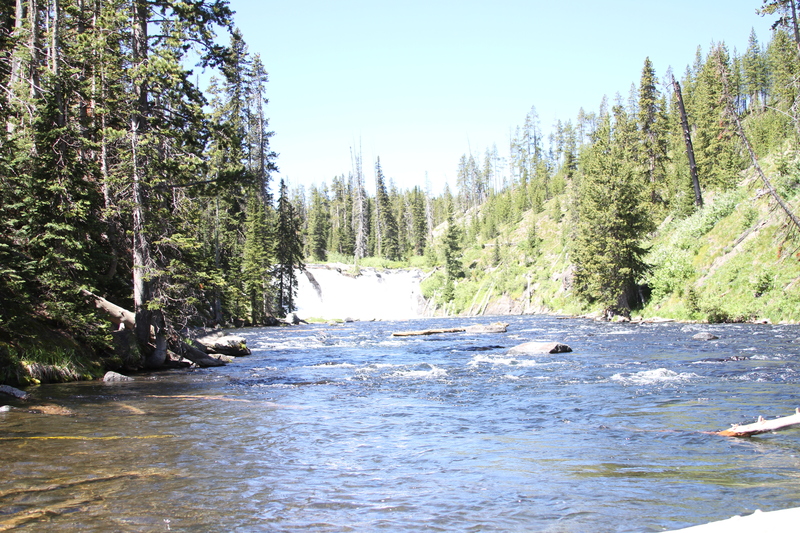 Yellowstone is one of the most popular national parks in the US and it is widely held as first national park, established by the US Congress in 1872. 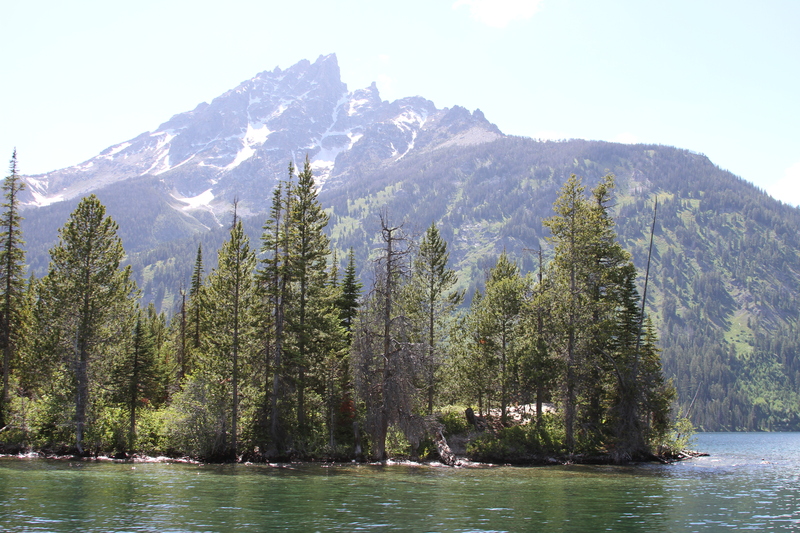 Though the park is mainly located in Wyoming, parts of it extend to Montana and Idaho. It’s so big it covers an area larger than the state of Rhode Island or Delaware. 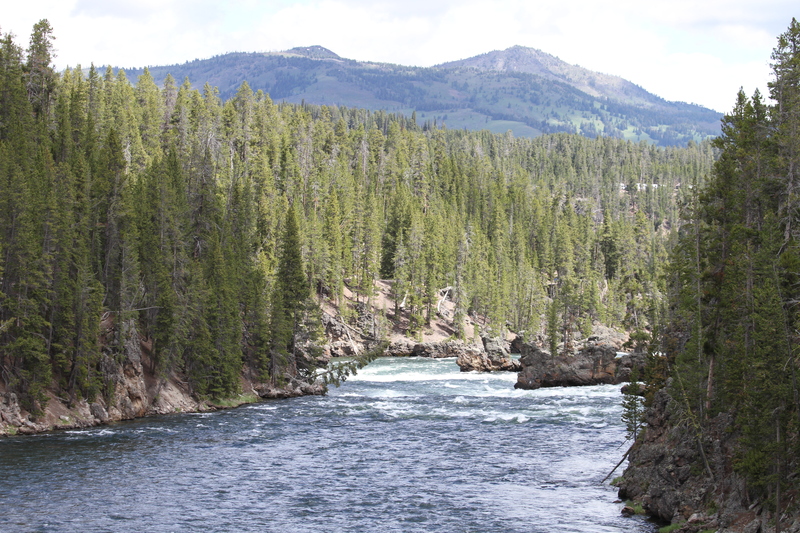 Above is a photo of the Grand Canyon of Yellowstone. 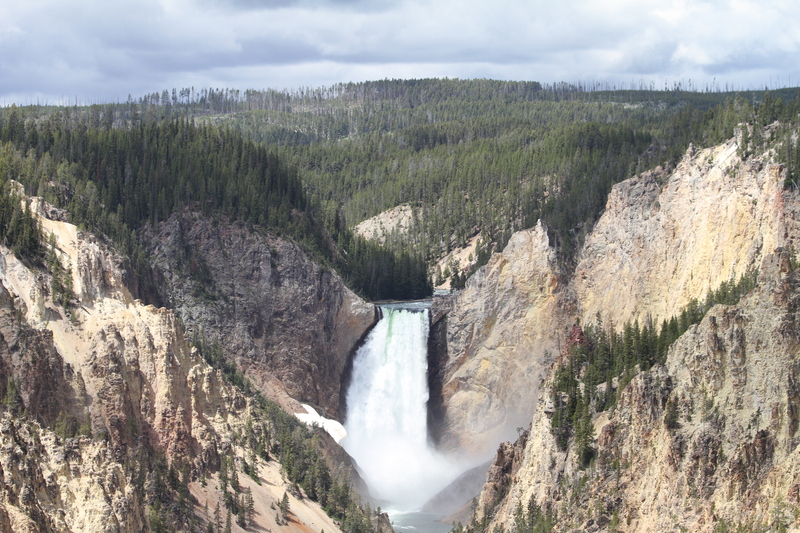 If you notice the color of the mountain rocks flanking the falls, then you can surmise why it was given the name Yellowstone. 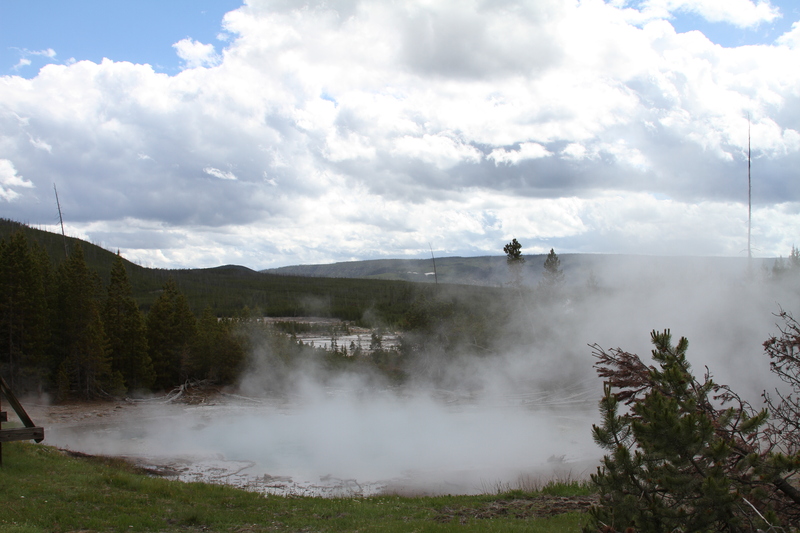 This national park is known for its geothermal properties. 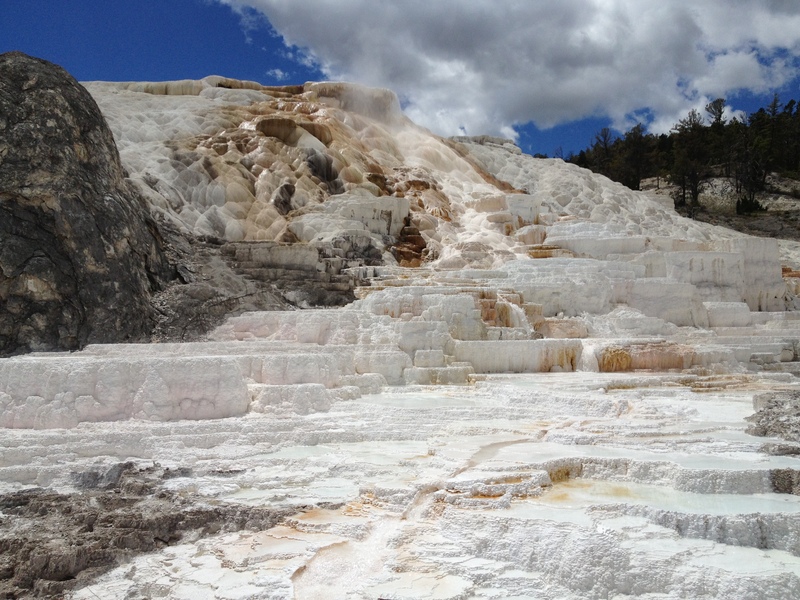 In fact, it is noted to be the largest volcanic system in North America. 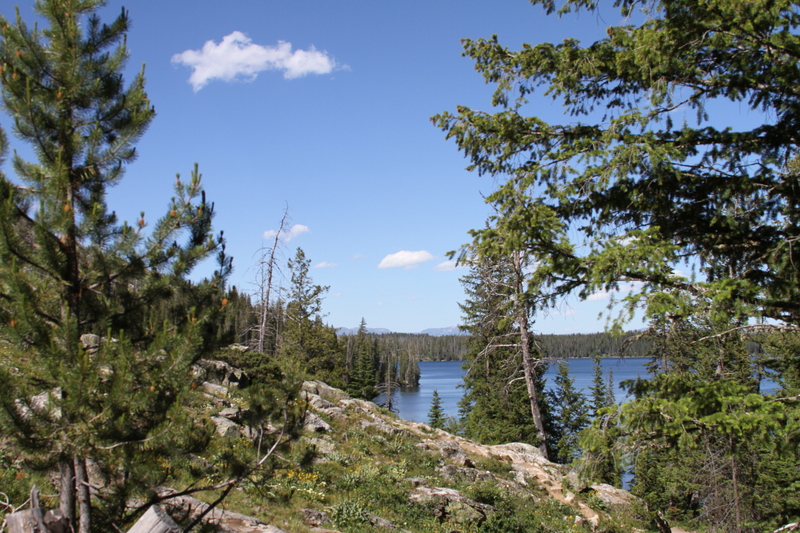 Many even believed that it is one large caldera, and termed as “supervolcano,” waiting to explode. Makes you wonder if the “big one” will occur anytime. 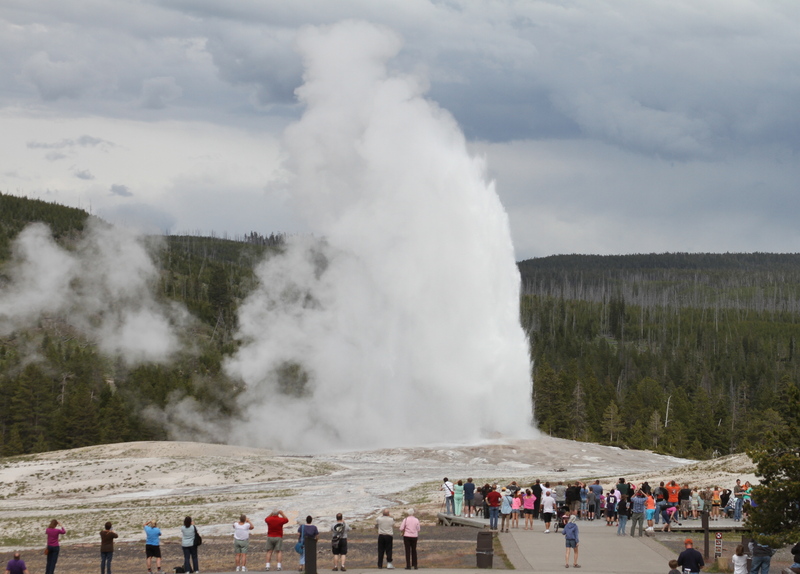 Below is Old Faithful Geyser, which is one of the main attractions of the park. It erupts approximately every 90 minutes. 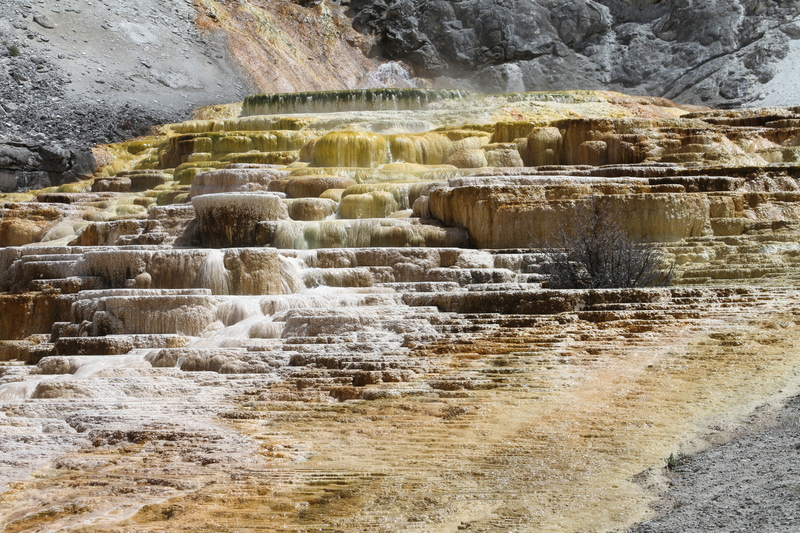 Here are some other hot springs that abound in the park. 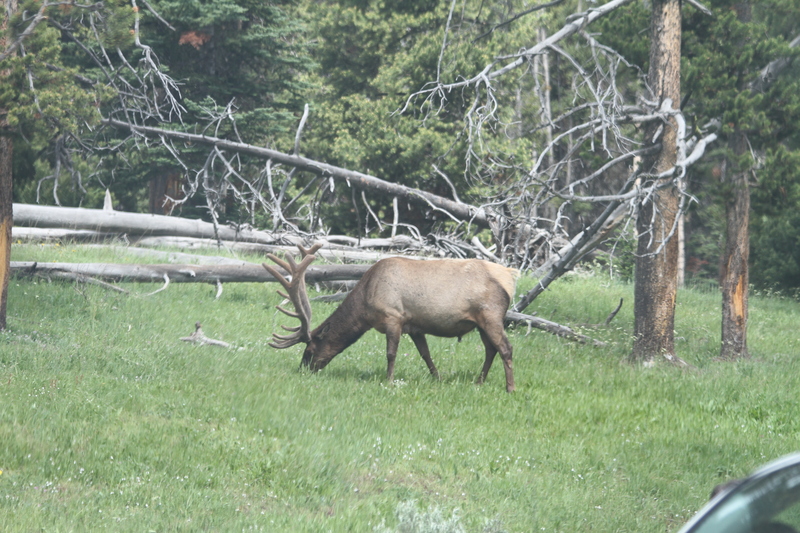 Aside from the hot springs and geysers, Yellowstone is well-known also for its wild creatures. Some of these wild animals can be dangerous, so visitors are warned to keep their distance from them. Growing up in the Philippines, I remember also being warned of dangerous wild beasts in my country that can seriously harm people. (No, I’m not talking about the politicians.) Besides the crocodiles and cobra, there’s also the aswang and tikbalang. Sorry, I digress. 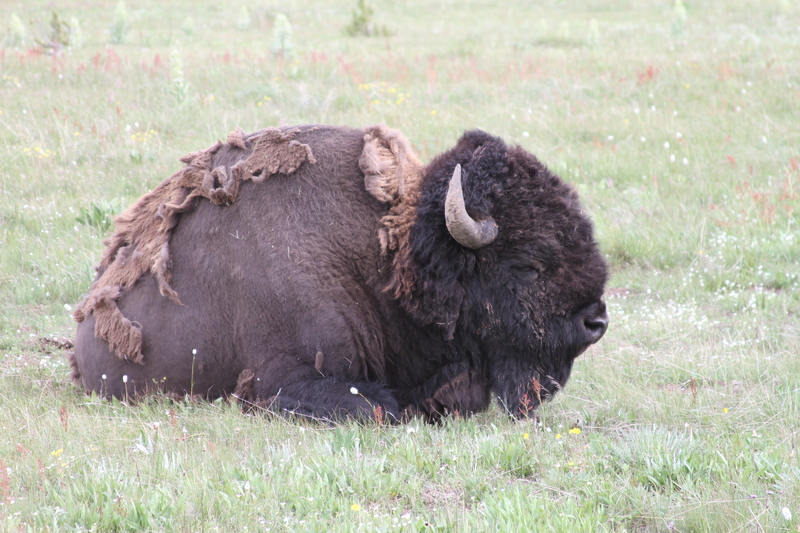 Here’s a resting buffalo (also known as bison), close and personal. Below is my favorite photo of a buffalo. And I can claim I captured it. What’s so special about it? Look closer. 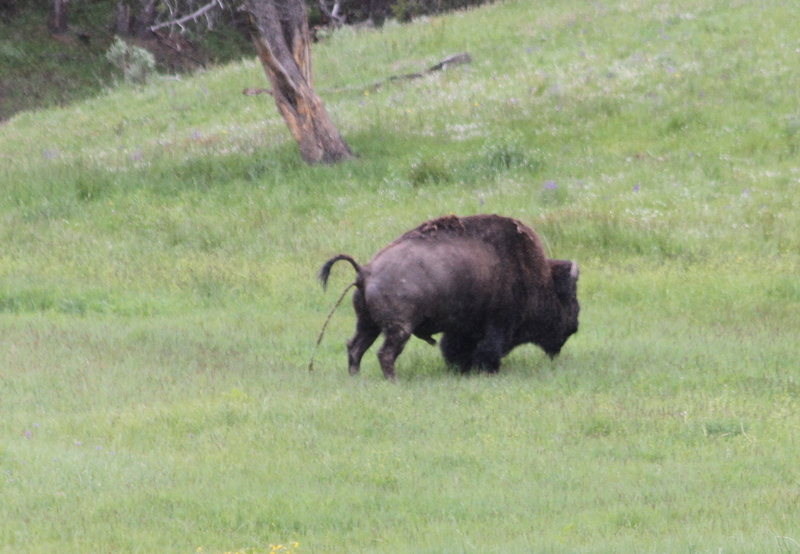 A pooping buffalo! 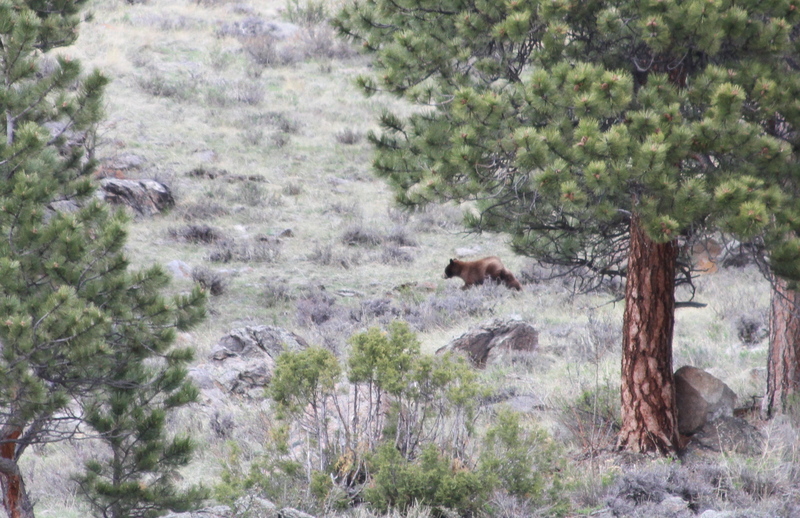 That’s technically bullish*t.
We were also fortunate to spot a bear. On two separate occasions! Even though bears are often pictured as warm and cuddly, with their jar of honey, that’s not really accurate. The fact of the matter is, they can attack and kill you, especially if they feel threatened. And even if you are Usain Bolt, you cannot outrun a bear (even a huge bear can run 30 mph). So we kept our distance. And then we also encounter this unidentified strange creature. A headless roadrunner! Beep! Beep! 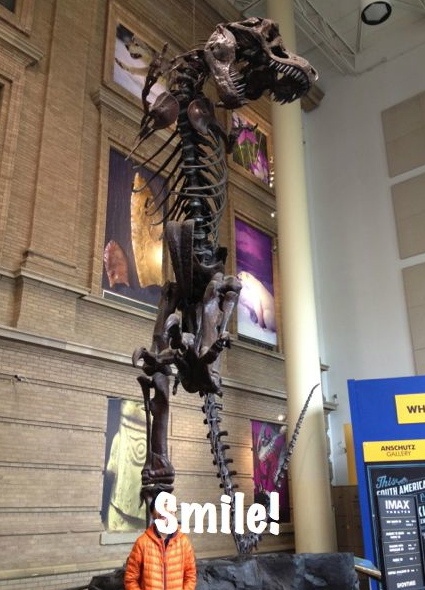 Oh wait…..that beast is Pinoytransplantae runnerus. 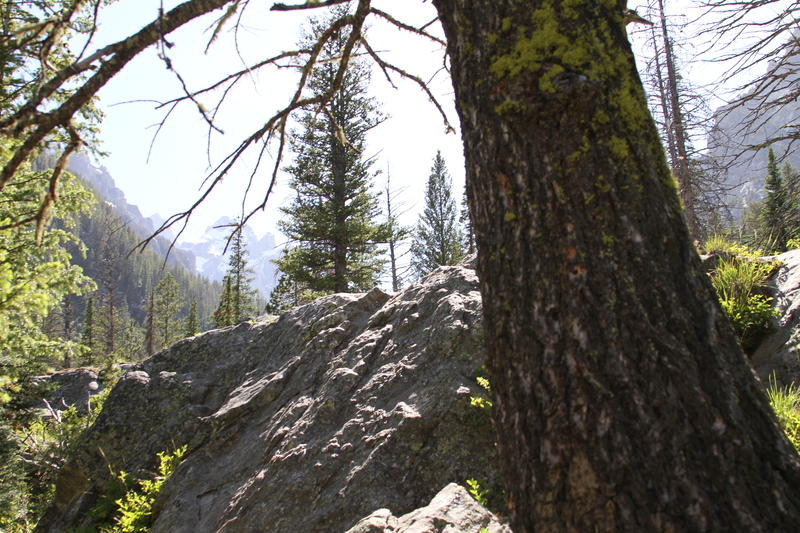 One fine day, while we were hiking in this wild, yet picturesque western landscape, we were on the constant lookout for wild creatures. 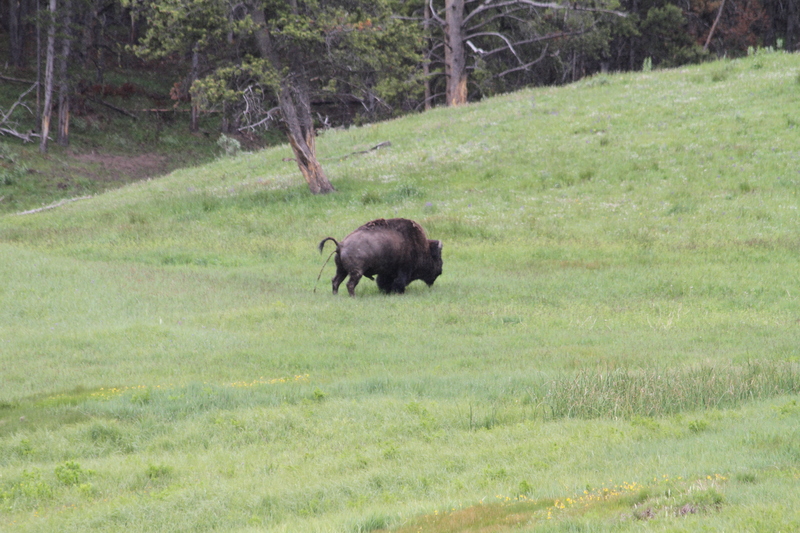 We were very aware that wild buffalos, elks, moose, coyotes, and even bears roam this place. 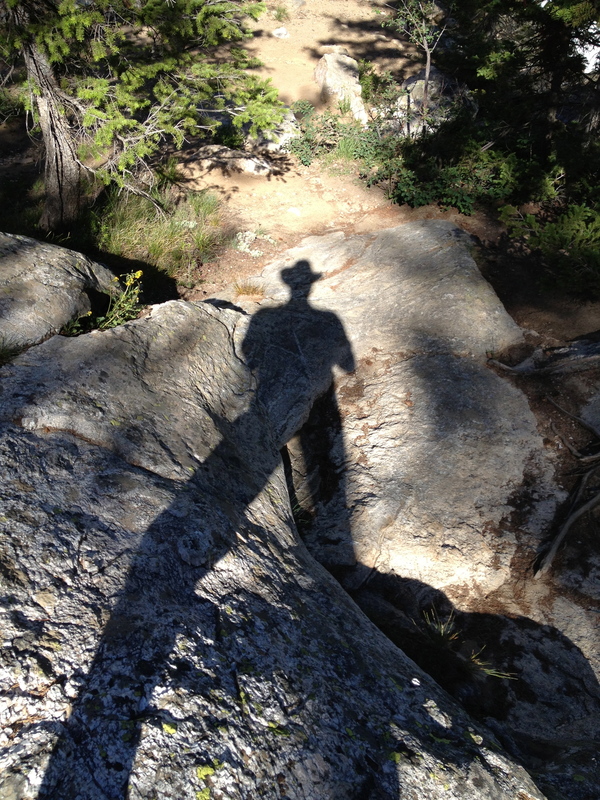 But instead, we spotted a solitary figure who emerged from the shadow. The familiar stance. The hat. Could it really be? Does he truly exist? Was it the legendary Lone Ranger? But before we can blink, the shadowy figure was gone. So we tried to pursue his trail towards the water edge. And there he was again! 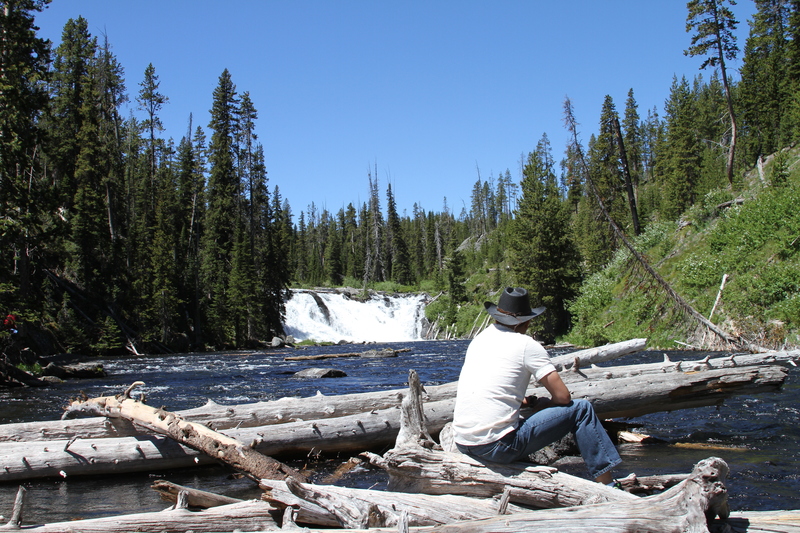 The Lone Ranger was resting among the fallen logs in the river, gazing at the nearby falls. Before we can come near him though, he once again, disappeared. 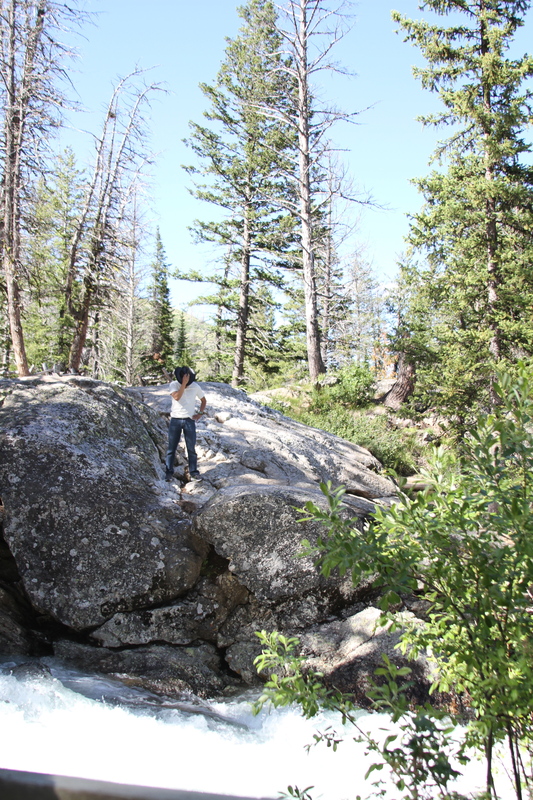 We crossed the river and climbed up the rugged mountain searching for him. And after some time, when we looked up, there he was! 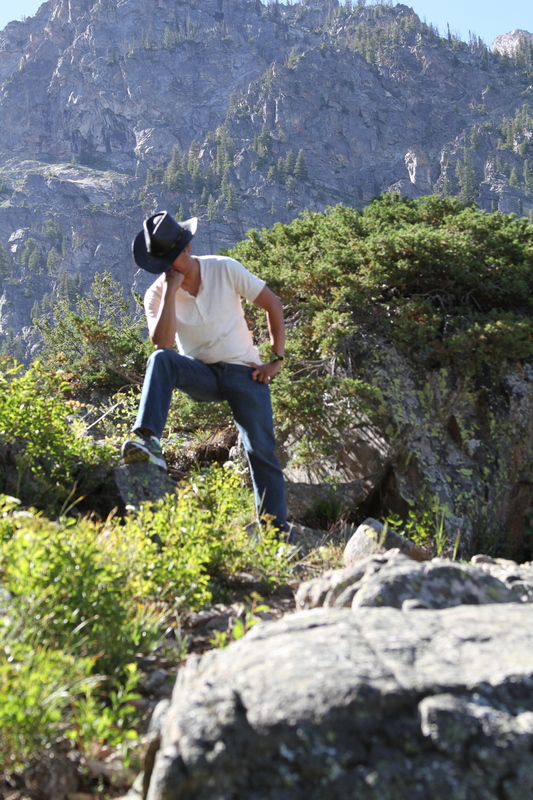 Perched high on the rocky cliff was the Lone Ranger. 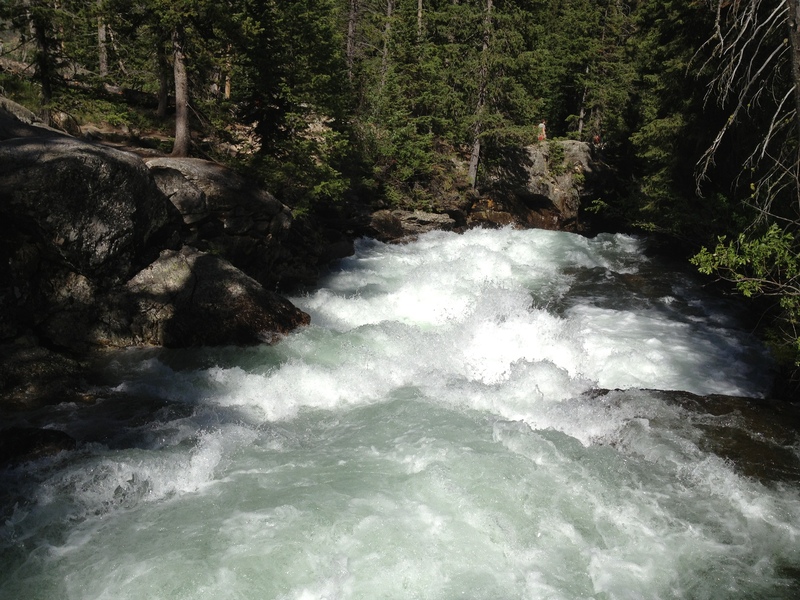 Now you see him…..
As we tread on higher up the mountain, we heard water gushing. We must be nearing a spring. 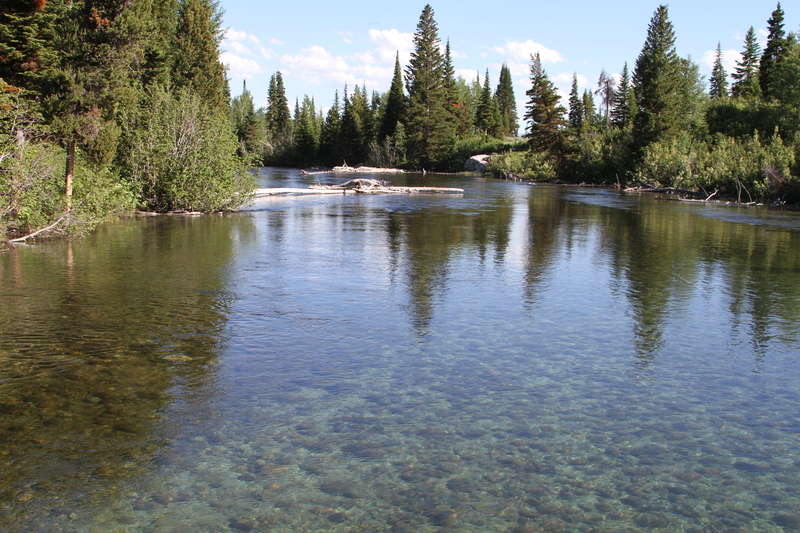 And sure enough, there was a refreshing rushing spring. And guess who was there? The Lone Ranger, of course! And then like a ghost, he vanished from our view. All what was left was a glimpse of his shadow. As we cannot find him no more, we trekked back down the mountain. 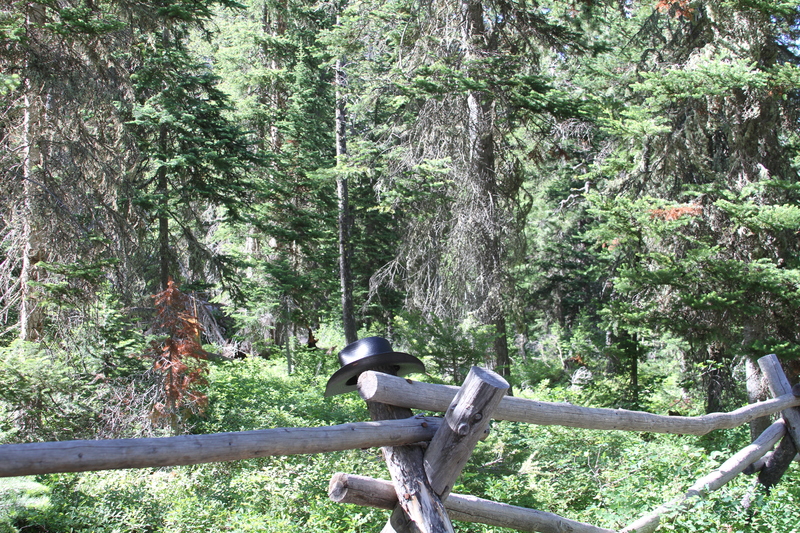 When we navigate our way through the forest, we saw the Lone Ranger’s hat. Was he nearby watching our every move? But we never saw him, not even his shadow again. Out of nowhere he came out into the open again! But wait a minute……he was with……he was with someone! He was not even a lone figure. That’s not the Lone Ranger! He was the Wrong Ranger! We were following the Wrong Ranger all along. The End. Our weather had been crazy lately. One day it was spring, with cool, crisp temperature in the 50’s F. Then came summer, hot and in the 80’s F. Then back to winter with cold winds at 30’s F with lots of snow in the forecast. And all of that in a stretch of few days. 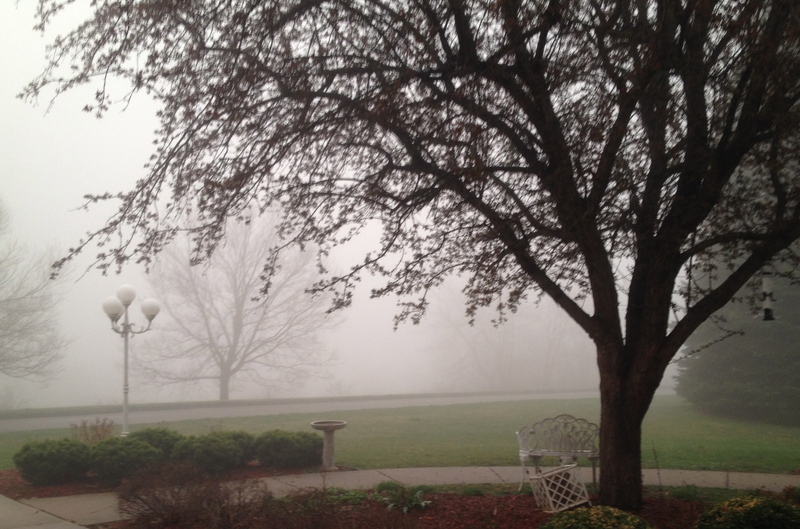 That’s Iowa weather for you. When there’s wild swings in the temperature with warm and cold air colliding, this causes unstable condition, and sudden thunder storms, or hailstorms, or even tornadoes can erupt. In fact, few days ago, some parts of Iowa had storms with ping-pong-size hail. Good thing no tornadoes have developed, yet (emphasis on the yet). While I was running inside our housing community, I did not feel the gusting winds right away, as the trees and houses blocked some of it. However when I went out to the lonely dirt road that was part of my running route, I experienced then the full effects of the wind force. The dirt road was in the vast open, with miles and miles of empty (still early for planting) corn fields, with nothing to block the gales. It was bad enough that I was running against the wind, but the worst part was that the strong gust was causing dust clouds. I thought of turning back, but that will be a longer way to go, so I decided to move on. It was not easy running against the wind, I can tell you that. That 1-mile stretch of dirt road that I usually cover in 10 minutes, took me forever to run. At least that’s how long it felt. But I made it through. In life, sometimes we feel that we are running against the wind. There will be opposition that will slow us down. They will blow dust in our face. And sometimes adversaries may even completely stop us in our tracks. We cannot choose the direction of the wind. We can only choose the direction where we want to go. And that means, sometimes we need to run against the wind. I woke up today and decided that I will run outside. It is the first day for Daylight Savings Time (DST) this year. That means, Spring is in the air! I looked at the temperature gauge outside and it was a few degrees above freezing. The snow that has blanketed our surrounding for most of the winter has largely melted and what was left were small patches. You may say that it was still too cold to go outside, but hey, I was wearing my Black Ninja running gear. Ninjas are fearless and are not afraid of anything, not even frosty weather. The sun was nowhere to be found, even though it was already 8 o’clock (DST), as dark clouds hang over the sky. In fact it was even drizzling. But since it was at least 35 degrees Fahrenheit (2 degrees Celsius) that means the rain will not freeze over the ground, and I will not encounter Black Ice (see post about Black Ice here). I was already running for about a mile, when I have noticed that my eyeglasses were fogging and fine precipitations were misting my vision. 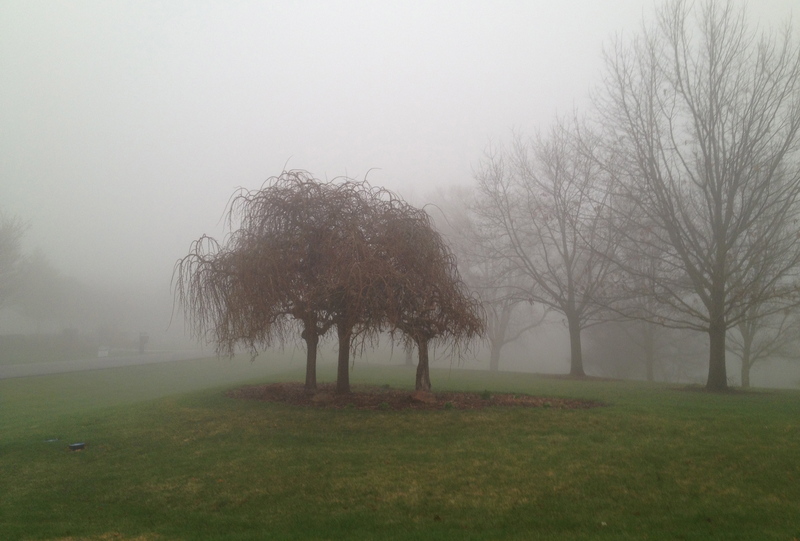 I also became aware of the gusty winds, and that the drizzle was getting stronger. But Ninjas are not afraid of the rain. Besides, I was too far out already to turn around, might as well press on. 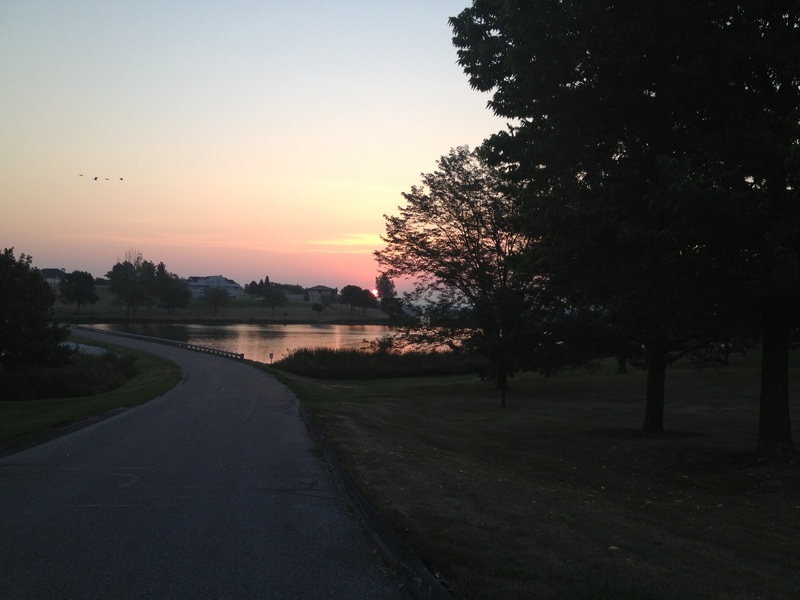 As I continue to run, I started to enjoy the morning even though it was not a picture perfect day. I have also observed that the migratory birds were back. 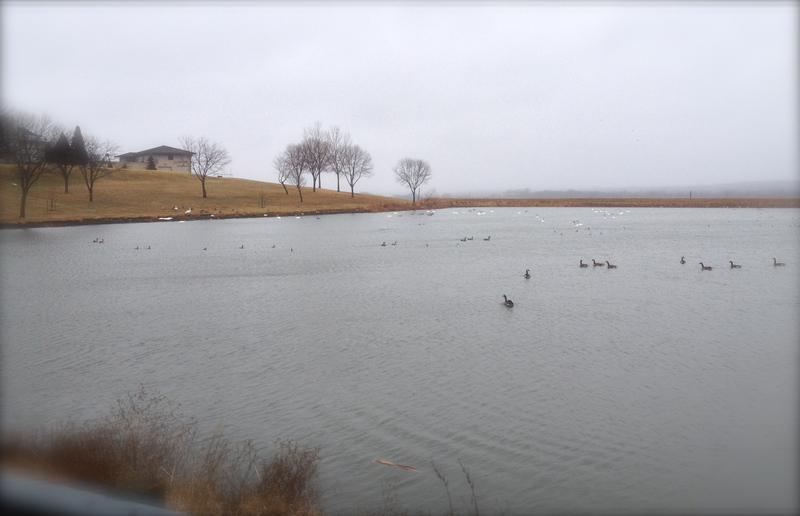 Here are the ducks, geese and swans taking a leisurely swim in the cold foggy morning. I completed my run without any major snag, though I have taken off my glasses the rest of the way. Ninjas don’t just rely on sight, they can feel their way with their keen sense of hearing, smell and “Ninja” sense. 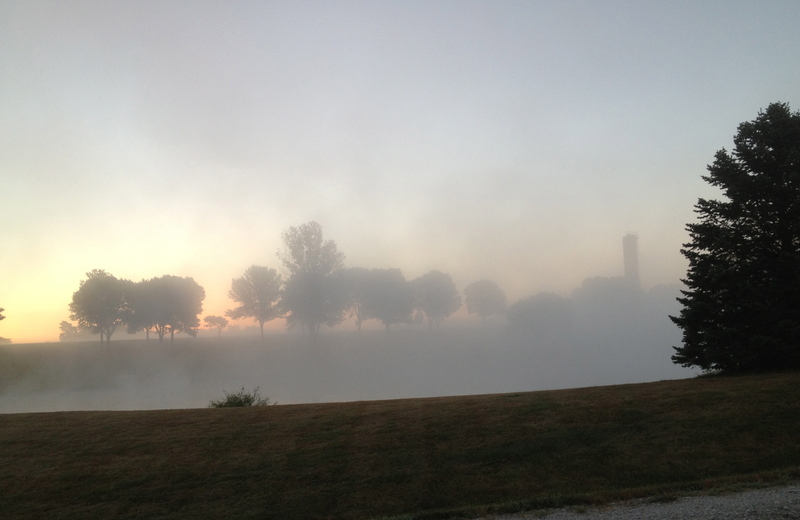 Yes, I may be a little out of breath and may have a little muscle soreness after the run, but it just feels so good to be out again, and breathe the cool misty air. The Black Ninja runner strikes again! Next on my running gear wish list: eyeglasses with wipers.